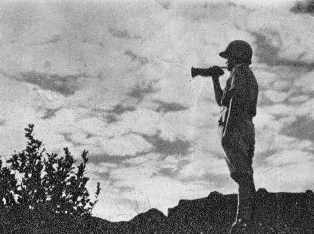 China's Expeditionary Forces and C.A.I. 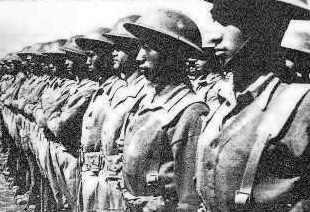 In the history of China's participation of war overseas, there were two Chinese Expeditionary Forces and one Chinese Army in India. 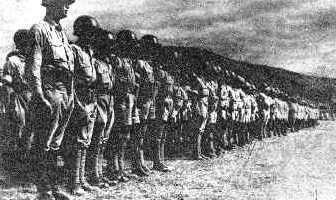 The first Chinese Expeditionary Force was sent from Yunnan in the spring of 1942 into Burma to participate in the defense of that country. 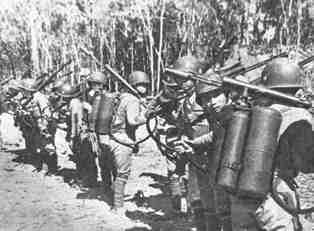 The words "1st Route" were attached to this Expeditionary Force, as the Japanese aggressive campaign was then at the height of its fury, and it was planned that additional expeditionary forces, to be designated 2nd and 3rd Routes, would be dispatched by China to the aid of her Allies in Siam and even the South Pacific. 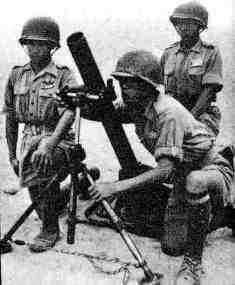 The first force was, however, generally known to the world merely as the Chinese Expeditionary Force, the words "into Burma" being sometimes designated together. 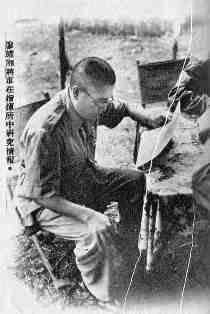 It was commanded by General Lo Cho-ying. 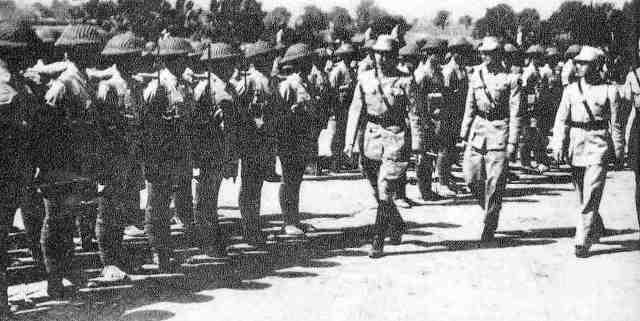 With the conclusion of the first Burma Expedition and the end of this mission of the first Chinese Expeditionary Force, the Chinese Army in India (C.A.I.) was created. This designation was adopted because there was no fighting in Indian territory, and an expeditionary force could not be stationed in an Allied country. The C.A.I. 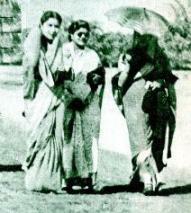 was to become an important actor in the later Burma campaign which reopened the route between India and China. 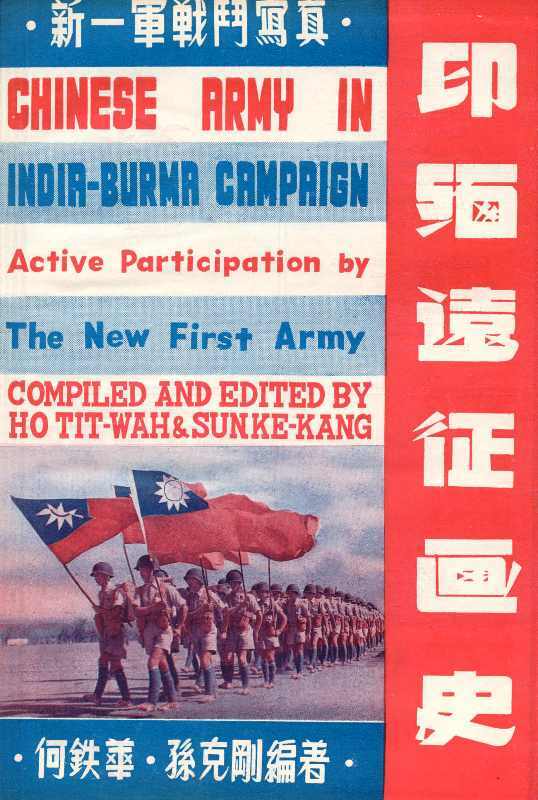 The New First Army, the achievements of which are recorded in this publication, constituted the major part of the C. A. I. 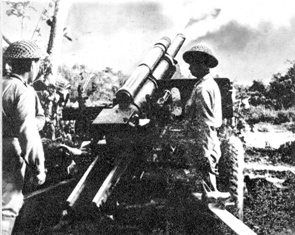 Throughout its later activities in the successful counter-attack in Burma and until its return to China after the completion of its mission, the C.A.I. maintained its original designation. 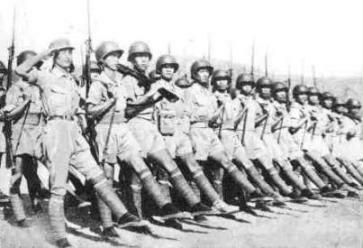 The second Expeditionary Force sent by China into Burma was organized in 1944. 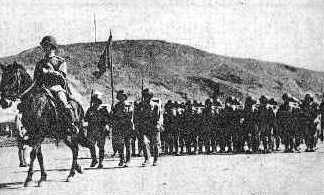 This force entered Burma from western Yunnan, under the command of General Chen Cheng, and later of General Wei Lin-huang, to co-ordinate with the efforts of the C.A.I. 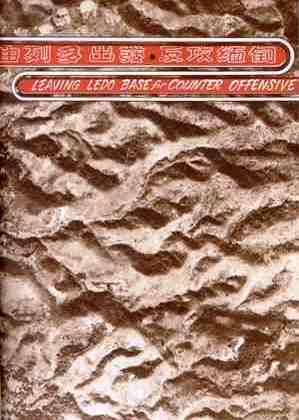 attacking from India. 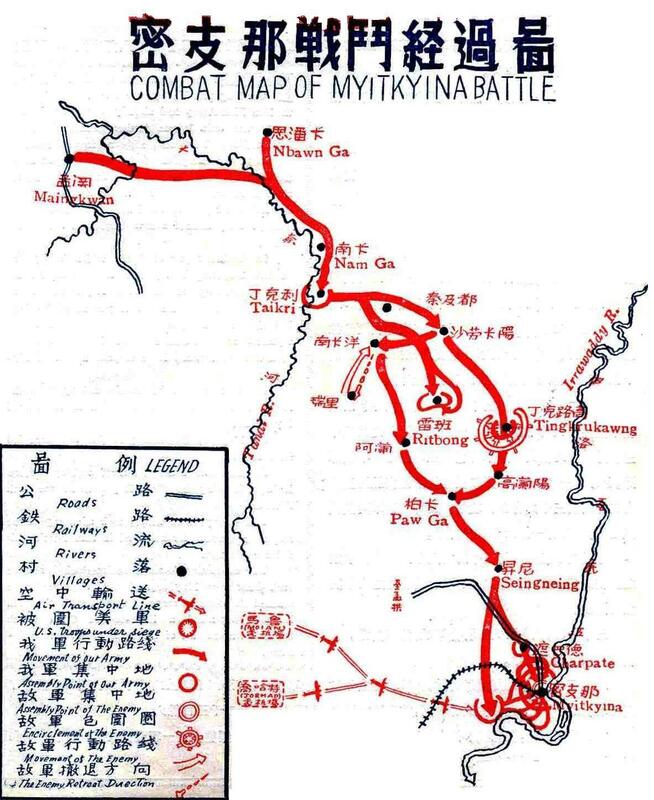 The two Chinese forces eventually effected a junction at Mongyu after a brilliant campaign. 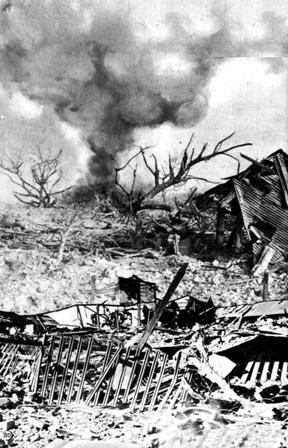 The Pearl Harbor treachery in December, 1941, presaged a wild attempt by Japan to penetrate southwards into the Pacific. 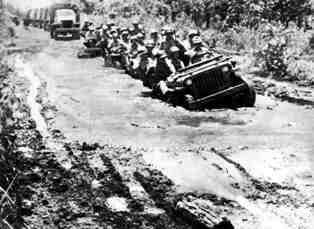 Following their capture of Singapore, the Japanese launched and intensified drive into Burma to deal a blow on our British ally and to cut off the sole surviving international route to China - the Burma Road. 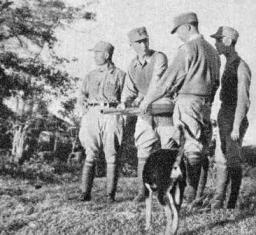 The combined forces of the Japanese 33rd, 55th and 18th Divisions took part in this offensive. 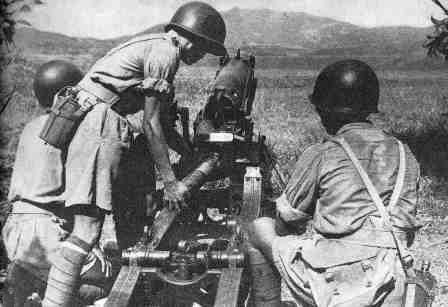 When Rangoon, capital of Burma, fell into Japanese hands on March 7, 1942, the Chinese Government at Britain's request dispatched the 5th, 6th and 65th Armies, then stationed at Yunnan, into Burma - the first Chinese Expeditionary Force. 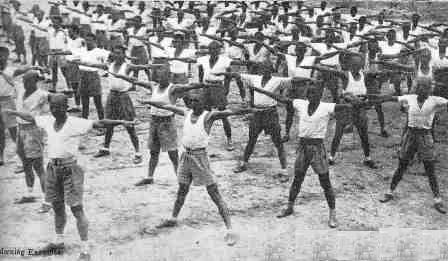 Out of this Expeditionary Force, the men of the New 38th Division and the New 22nd Division were later transferred to India to form the nucleus of the C.A.I. The Birth of the C.A.I. 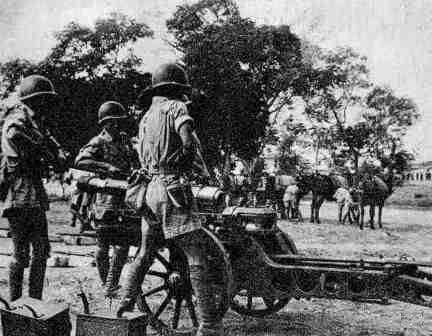 The first Burma campaign failed because of inadequacy of Allied preparedness and the lateness in the arrival of the Chinese forces. 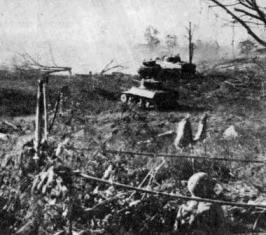 Nevertheless, during the campaign, the 5th Army inflicted a severe toll on the enemy, while the New 38th Division achieved the great feat of rescuing more than 7,000 British troops from a Japanese trap at Yenangyaung. 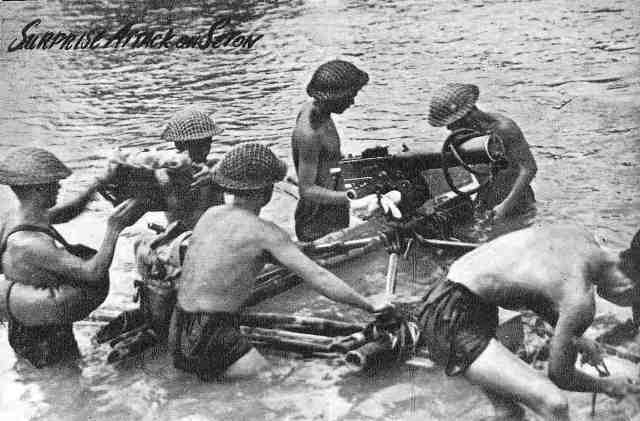 The withdrawal from Burma, in the face of overwhelming odds, was finally effected under great difficulties by June 8, 1942. 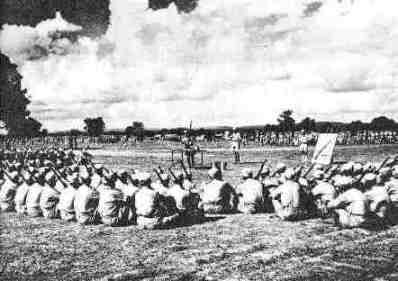 On June 14, 1942, a military review took place at New Delhi on the occasion of United Nations' Day. 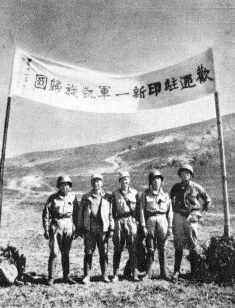 A squad from the New 38th Division represented China on the occasion, and made a plausible impression to the Allied leaders. 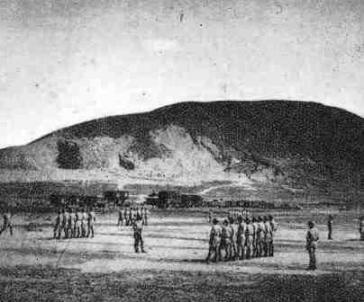 Both British and Indian circles expressed open admiration for the Chinese achievements at the Burma expedition just concluded, and the foundations were laid for the stationing of a Chinese Army in India. 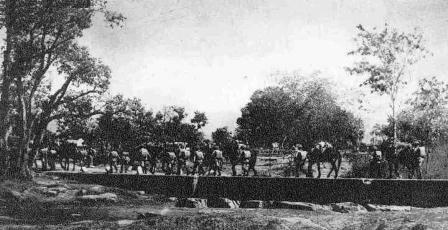 The 38th Division, which had withdrawn into Indian territory, was a month later transferred to Ramgarh for training. 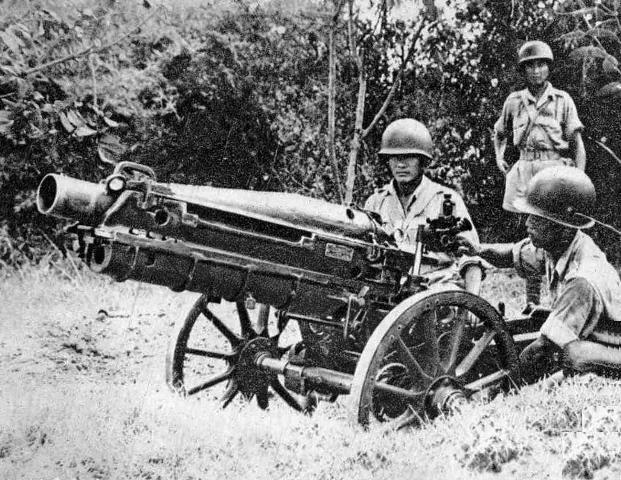 The division was soon joined by the New 22nd Division, originally intended to be withdrawn into Yunnan, but re-directed to India. 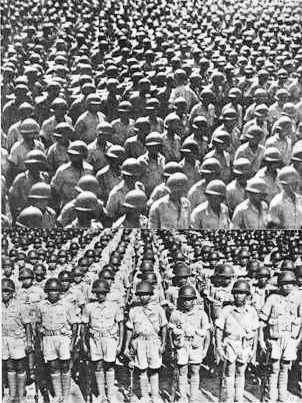 In August, 1942, the Chinese Army in India was officially formed. 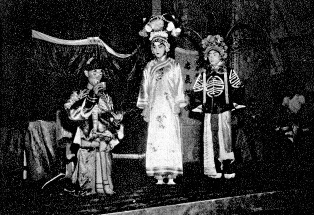 General Stilwell, Chief of staff in the China Theatre, was appointed Commander-in-Chief, with General Lo Cho-ying as his deputy. 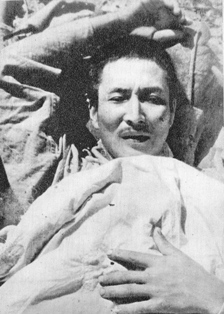 In the spring of 1943, General Lo was transferred to a post at home. 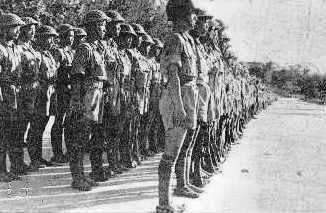 The High Command organized the New 38th Division, the New 22nd Division, and the newly created 30th Division (formed in India) into a new army - the New First Army. Lt. Gen. Cheng Tung-kuo was placed in command of the Army with Lt. Gen. Sun Li-jen as the Deputy Commander, who commanded the New 38th Division concurrently. The New 30th Division was commanded by Maj. Gen. Hu Shu, while Maj. Gen. Liao Yao-hsiang retained the command of the New 22nd Division. 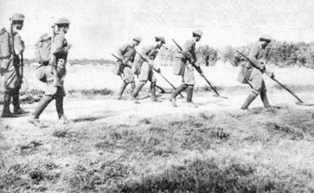 Artillery regiments, Engineering regiments, motor transport regiments, armored car units, anti-aircraft units, signal corps, special service units, military police units, and men and animal transportation units, either sent from home or newly organized in India, increased the strength of the Army which was subsequently further augmented by the 14th and 50 Divisions after its march into the Hukawng Valley. 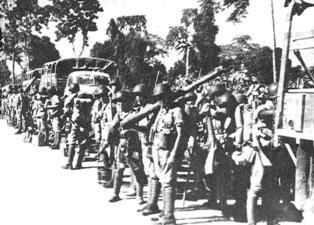 The counter-offensive in Burma really began in March 1943, when the vanguards of the New 38th Division undertook the duty of annihilating or expelling the enemy on the Indian border so that the initial engineering work on the India-Burma Road could be protected. 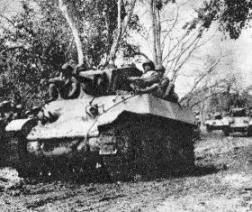 This prelude to the actual campaign was successfully completed ny the end of October, 1943, when the enemy's 18th Division, reputed a strong force, was driven away from its stronghold. 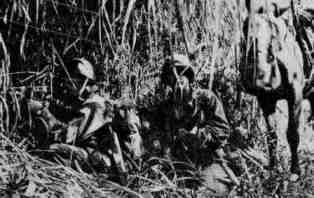 The operations at this juncture were carried out under greatest difficulties, for in addition to the obstinate enemy, our forces had to combat the reptile infested jungle, where communications were entirely underdeveloped. 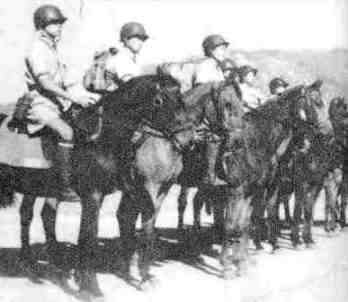 On the eve of New Year's Day of 1944, the New 38th Division successfully took Yupong Ga, and reinforcements arrived later. 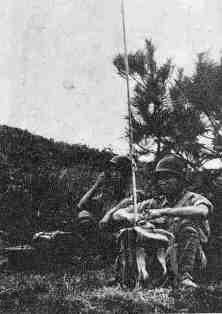 By February, 1944, the New 38th Division, continuing its success, occupied Taipha Ga, while the New 22nd Division also captured Taro, and the two forces launched a combined attack against Maingkwan. 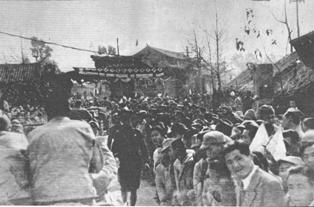 The victory at Walawbum on March 9 concluded the Hukawng Valley campaign. 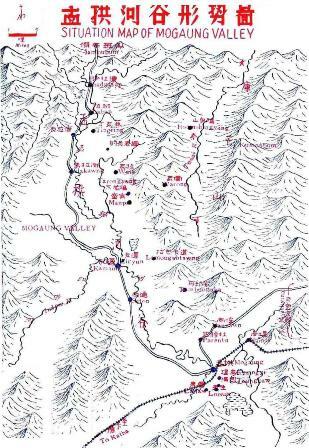 The enemy defense of the Mogaung Valley was aided by its geographical advantages and the Chinese progress was considerably checked by the difficult terrain. 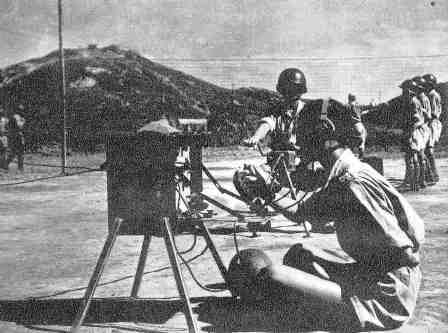 By the latter part of May, 1944, however, when a new strategy was employed we made our advance. In spite of the high water level on the river with the approach of the rainy season we succeeded in crossing the Namkawng River. This act surprised the enemy and cut off his retreat, capturing at the same time much of his supplies. The famous Battle of Seton ensued with disastrous results to the enemy. 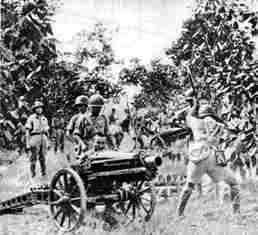 On June 16, we captured Kamaing, and on the 25th of the same month Mogaung also fell. 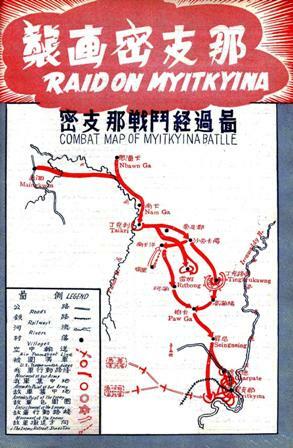 Simultaneous with this fighting in the Mogaung Valley, the fight for Myitkyina also raged high. 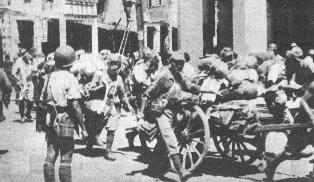 A combined Chinese-American detachment, consisting of the New 38th Division, the 50th Division, and a portion of the 14th Division, with one regiment of American troops, attacked that important city. 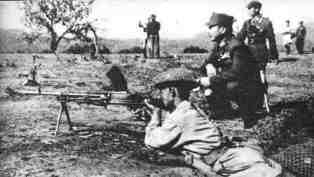 The Japanese staged a desperate defense and street fighting raged for 80 days. 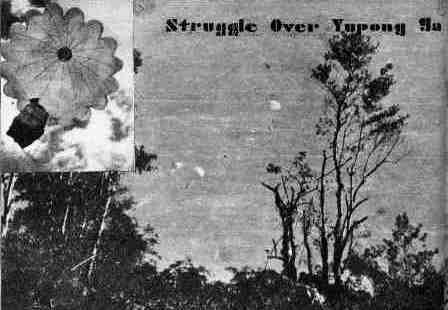 The city finally fell on August 4, and the first stage of the Burma counter-offensive was concluded. now composed of two armies - the New First and the New Sixth. 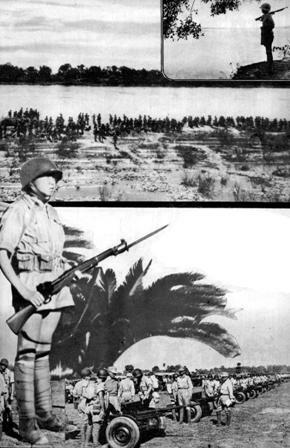 The New First Army consisted of the New 30th Division and the New 38th Division. 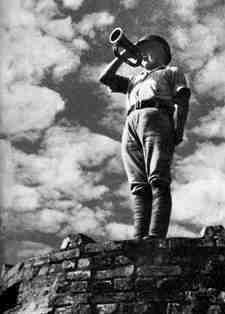 The New Sixth Army had under its command the 14th Division, the 50th Division, and the New 38th Division. 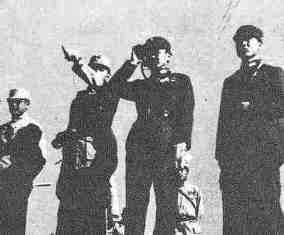 General Sun Li-jen commanded the New 1st Army while General Liao Yao-hsiang commanded the New 6th. 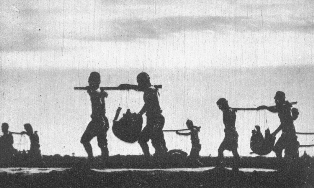 The rainy season of Burma ended by October when C.A.I. commenced its second phase of offensive. 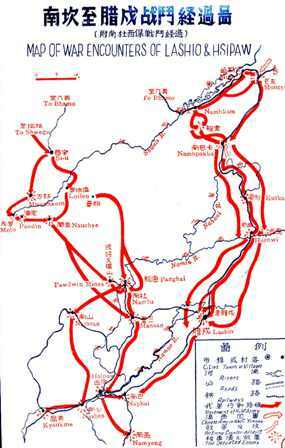 The New 6th Army except the 50th Division which became part of the New First, had in the meantime been transferred to the home front and the New 1st Army continued its march towards Bhamo to complete the task of opening the overland road from India to China. 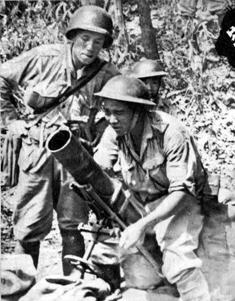 The siege of Bhamo reached its fiercest stage on November 17, 1944, when the Japanese resorted again to a desperate defense strategy. 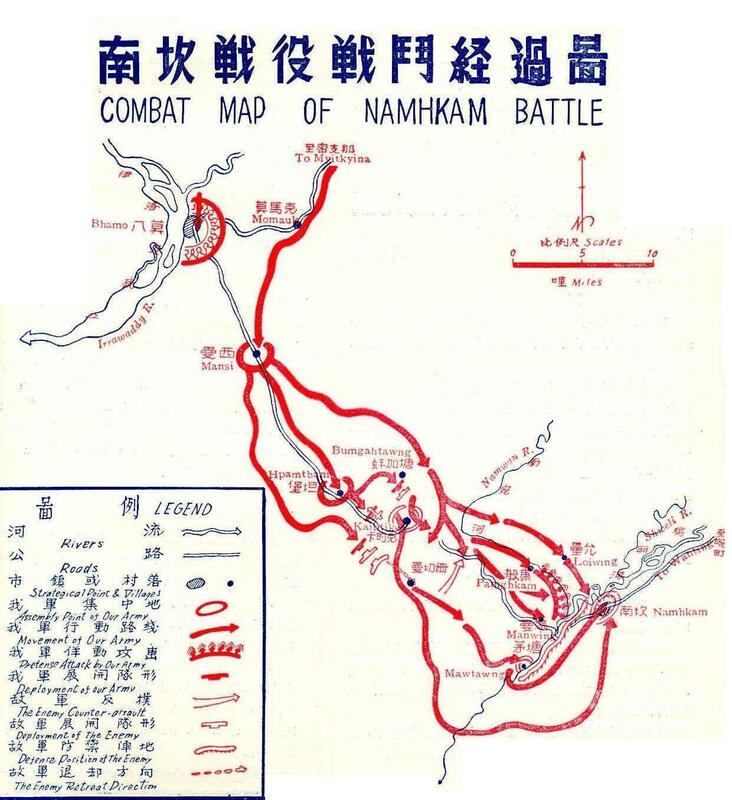 By December 15, enemy lines were fully penetrated, and the Chinese force pushing ahead passed Bhamo towards Namhkam. 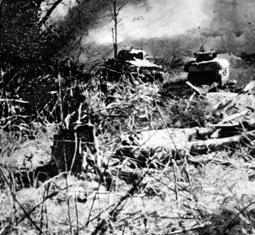 The Army was now met by the Japanese 49th Division, which had been specially transferred to Burma from Korea, only to be routed after five days of intensified combat. 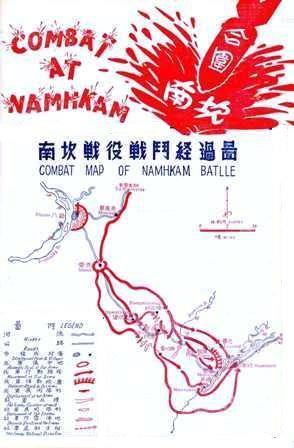 Namhkam was entered by the New 30th Division on January 15, 1945. 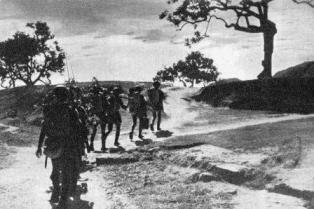 On January 27, the New 38th Division captured Mongyu, the junction between the new India Road and the former Burma Road. The following day, a ceremony was held to celebrate the junction of C.A.I. 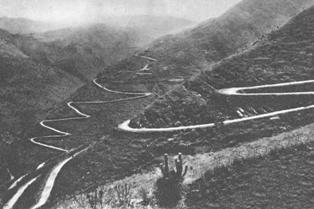 and Expeditionary Force from Yunnan, and Stilwell Road was fully opened. 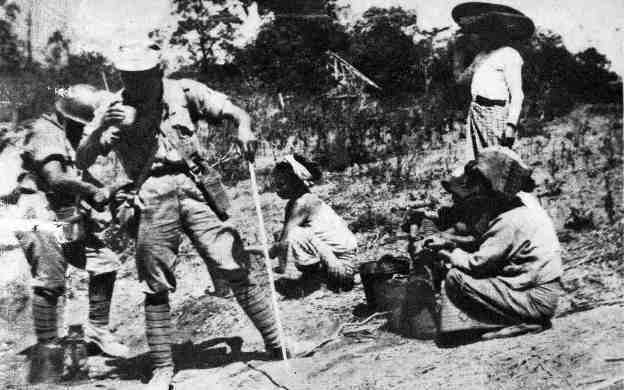 To render effective assistance to our British allies fighting in lower Burma and to protect the newly opened Stilwell Road, the New First Army continued toi push southward towards central Burma. 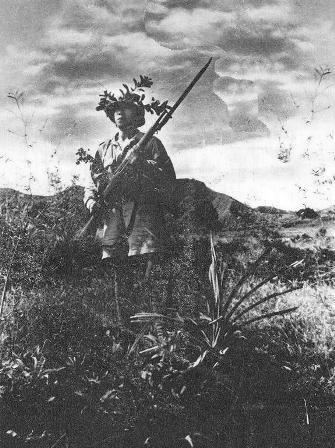 On February 20, the New 30th Division captured Hsenwi, while on March 8, the New 38th Division captured Lashio. 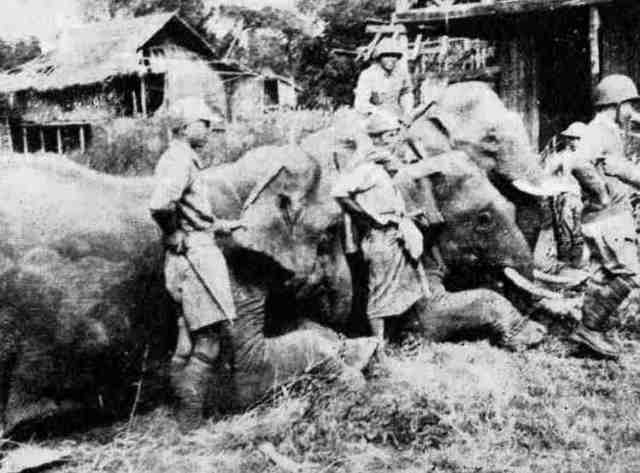 At the same time, the 50th Division, sweeping down from Katha, also captured in succession Mwanhawn, Namtu, and Hsipaw. 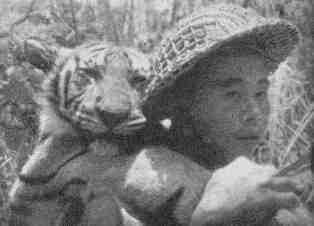 On March 20, Kyankme was captured, completing the chain of victories of the Chinese Army in the Burma campaign. 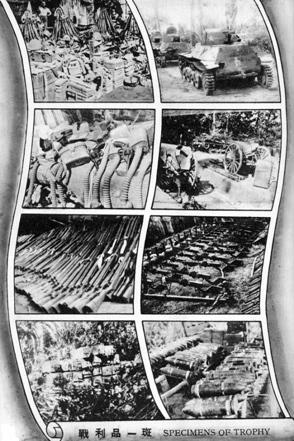 The campaign in Burma occupied two full years, practically all of which were fully taken up in fighting against all odds. 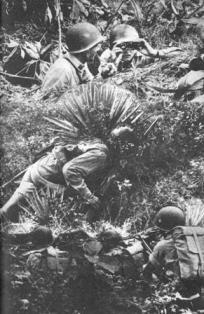 The difficult terrain and jungle fighting will all its horrors were strenuously overcome. All these factors made up an epic episode of achievement in our military annal. 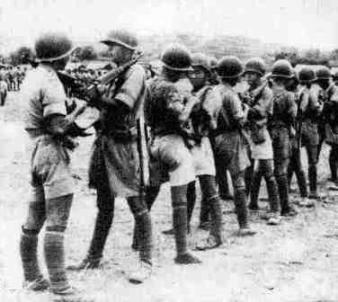 During the campaign, Chinese Army encountered the Japanese 2nd, 18th, 49th, 53rd, and 56th Divisions and the 34th Independent Brigade, as well as other special units. 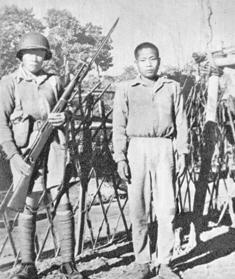 The enemy suffered 33,082 dead, including many ranking officers, while another 75,000 casualties were counted as wounded, and more than 300 prisoners taken. The enemy practically suffered total annihilation. Our casualties were about one-sixth of that of the enemy. 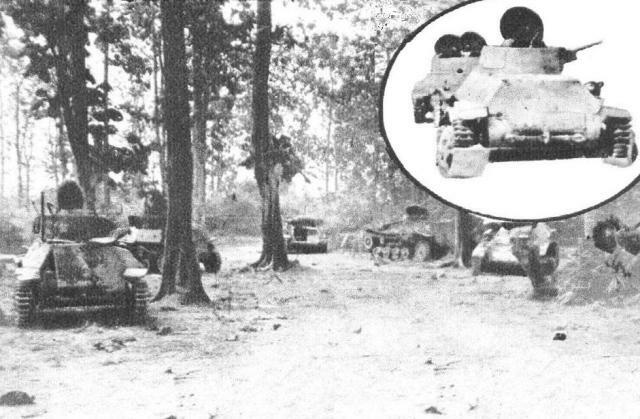 Trophies which were taken included 7,938 rifles, 643 machine guns, 185 cannons, 553 motor vehicles, 453 locomotives and wagons, 67 tanks, 5 airplanes, 108 godowns, and more than 20,000 tons of metals. The area liberated cy C.A.I. was more than 50,000 square miles, in which were 646 miles of highways and 161 miles of railroads. 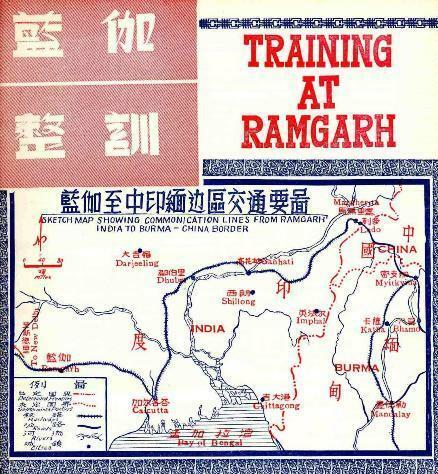 Chosen as the training center for Chinese Army in India, the small town of Ramgarh in the Province of Bihar soon bustled with life. The Chinese flag fluttered gaily over this part of land where Buddha was born. Though in the winter nights the air is a bit cold, the sun remains hot all the year around. 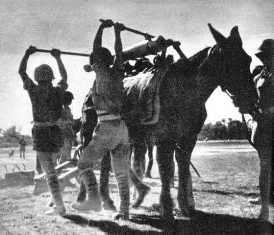 Training was usually undertaken in intense heat. 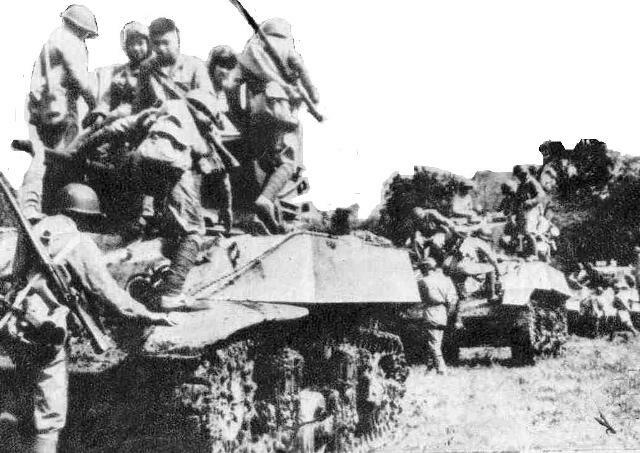 Besides the daily drill by units themselves, the Army was given sunstantial training in motor driving, tank operation, artillery, anti-gas practices, signal communications, engineering, ordnance and veterinary courses. 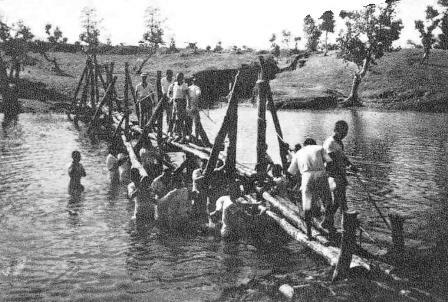 As the ultimate mission of the Army was to recapture Burma, emphasis was placed on jungle fighting, hill and tree climbing, bridge building and similar exertions were being conscientiously gone through by both officers and men. The building up of a strong body was, of course, a primary prerequisite for all men. No time was spared in conducting a vigorous exercise as an all round activity. 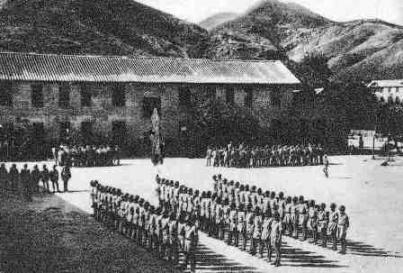 Political training, morale up-lifting and general improvement on the Knowledge of the soldiers also occupied an important place in the schedule. 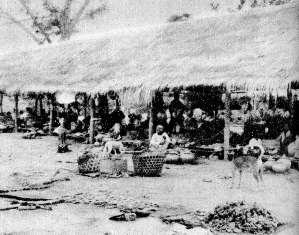 English, Hindustani and Burmese were avidly studied in order to enable the men to cultivate a better understanding with the local people with whom they had to come in contact. 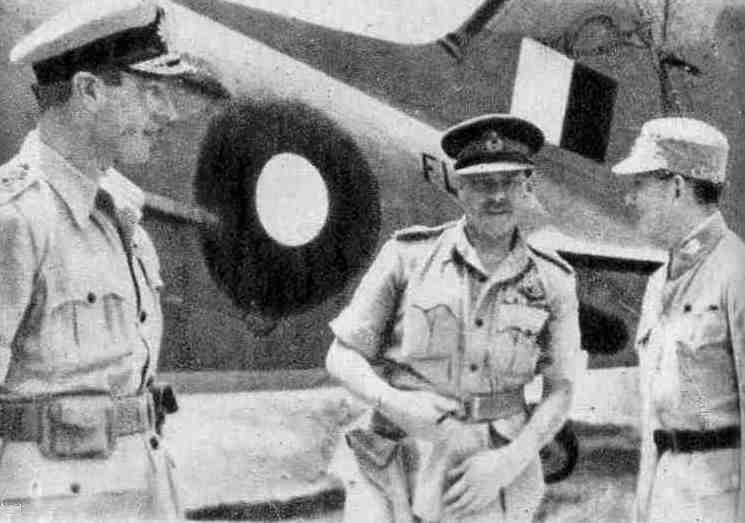 Chief-of-Staff General Ho Ying-ching on his visit to India at invitation of Marshal Wavell, Viceroy of India, February, 1943. 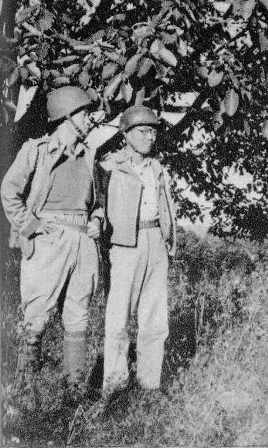 General Ho made a special tour to Ramgarh Training Center where a maneuver was held for his review. 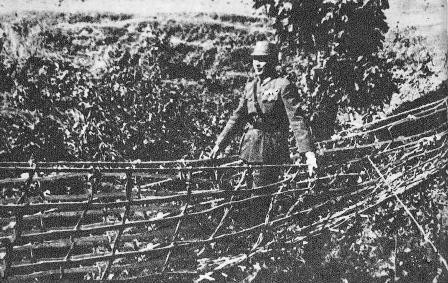 GENERAL HO YING-CHING TESTING THE SUSPENSION BRIDGE CONSTRUCTED BY THE ENGINEER CORPS. 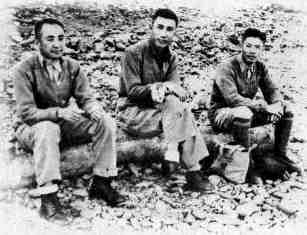 GENERAL HO ON INSPECTION OF MANEUVERS, ACCOMPANIED BY LT. GEN. SUN (LEFT), LT. GEN. LIAO YAO-HSIANG (SECOND TO LEFT) AND MAJ. GEN. TANG SHOU-CHIH (EXTREME RIGHT). 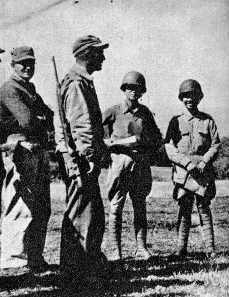 GENERAL HO CONFERRING A MEDAL OF AWARD TO MACHINE-GUNNER PVT. 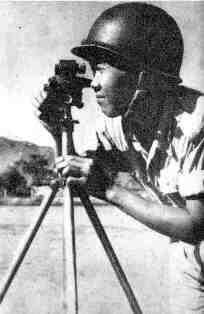 WANG CHING, WHO DID A BRILLIANT PART IN THE MANEUVER BY HOLDING TO HIS POSITION FIRING. 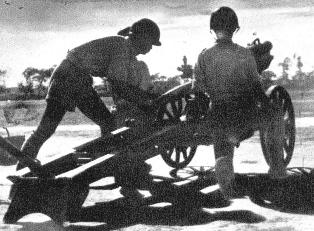 A DAILY ROUTINE OF THE ARTILLERY CORPS. 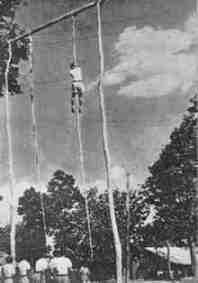 By the spring of 1943, the Army had fairly completed its training. 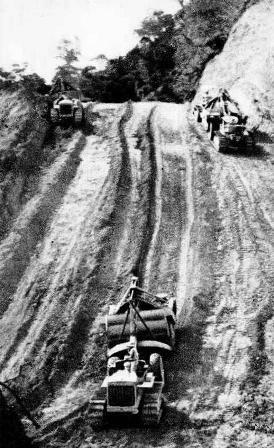 The Burma Road had been closed for a year, and China was in dire need of a new international supply route for the importation of war supplies. 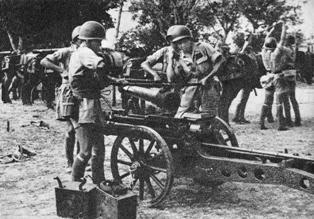 The time came for launching a counter-offensive in Burma so that the supply line might be established. 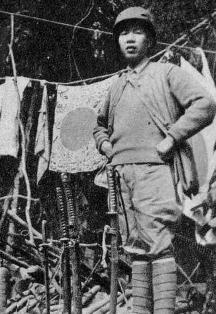 General Sun Li-jen, as Advance Commander, led the New 38th Division as the vanguard of the campaign. 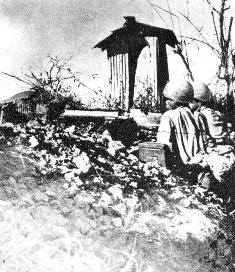 From Ramgarh the Division returned to Ledo and took up the duty in annihilating the enemy in the Hukawng Valley in order to safeguard the supply junction in India. 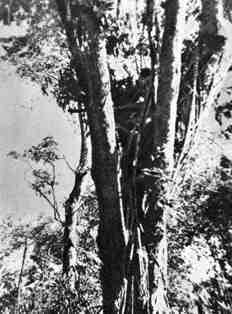 Ledo, a small hamlet on the edge of a primeval jungle, soon grew into a town with railroad extension from the Indian trunk lines. 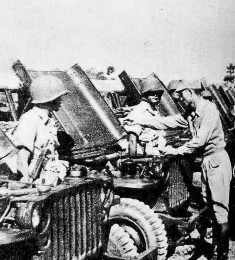 With the influx of troops it also became an armed camp, the operation base for launching a counter-offensive against the enemy in Burma and the springboard for an immediate campaign. 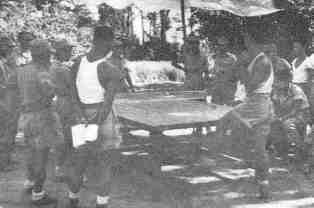 A further period of training in jungle fighting was given the New 38th Division before their actual drive into Burma. On the path of the campaigners lay an immense tract of wild jungles and swamps infested by harmful animals, insects and brambles. 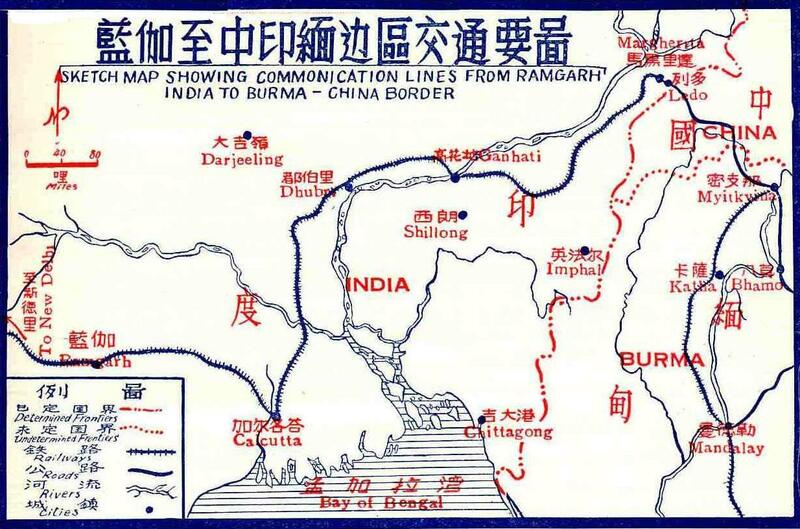 Many lives had already been lost in this region during the Chinese troops' earlier withdrawal from Burma into India. 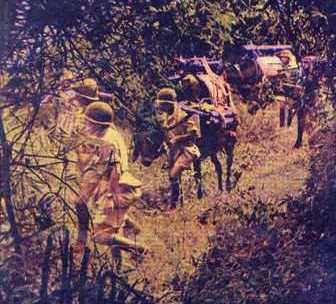 The memory of the past incited the Army to a full determination in accomplishing their task. Eight months were spent in hewing a mountain path through this region, driving away the enemy, and allowing the engineers following in the wake of the Army to build the road. 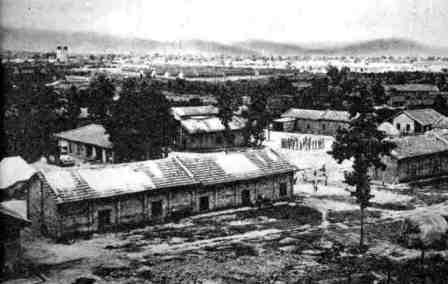 Surmounting the almost unbelievable difficulties, the New 38th Division conquered the border jungle, and in the early winter of 1943, occupied Shingbwiyang, which served as the advance base for the push towards the Hukawng Valley. 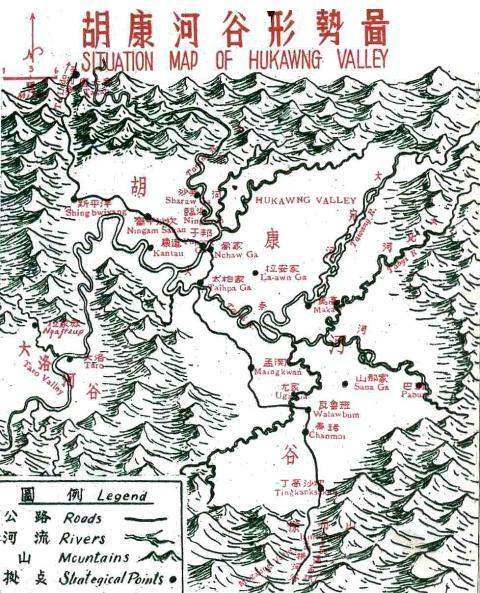 The Hukawng Valley was one of the most atrategic important areas in the Burma campaign. 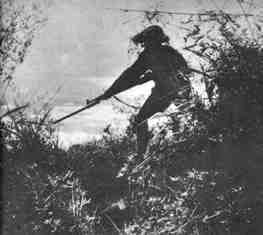 The 18th Japanese Division, accredited as the enemy's "invincible" force, held sway over the area. 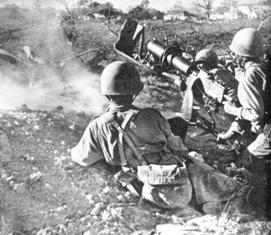 The battle for Yupong Ga was the first fierce encounter in the counter-offensive in Burma. Chinese Army encountered an enemy force five times its own strength, and there was encirclement and re-encirclement of each other during the whole campaign. 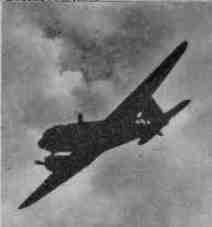 One battalion of the 112th Regiment was cut off from contact for 36 days, depending on supplies dropped by planes. Casualties suffered by both fighting parties were high. 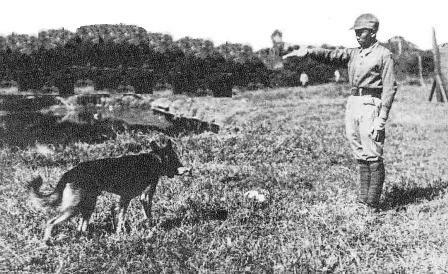 On December 21, 1944, General Sun Li-jen personally led a rescue party and with courage and strategy completely routed a most obstinate enemy force, heralding other suvvesses that were to follow in the campaign. 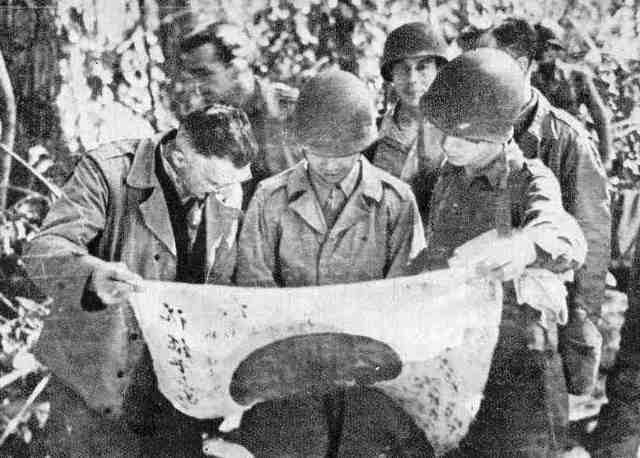 General Stilwell presented General Sun with a special pennant to commemorate this unprecedented victory. 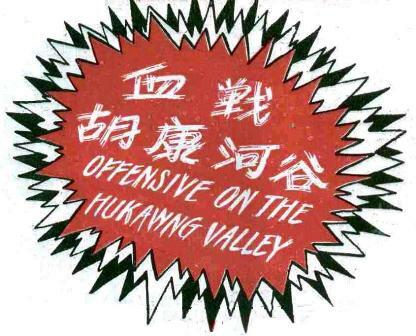 The enemy now entrenched himself at Taipha Ga. For the first time, the Chinese Army adopted the strategy of "swirving" fighting and divided forces to attack on all flanks. 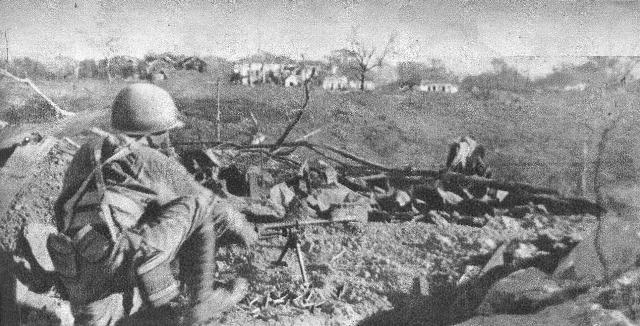 On February 1, the forces attacking the enemy's left scored such successes that the enemy was forced to abandon his plan of defensive fighting and come out in the open, to be defeated and routed. 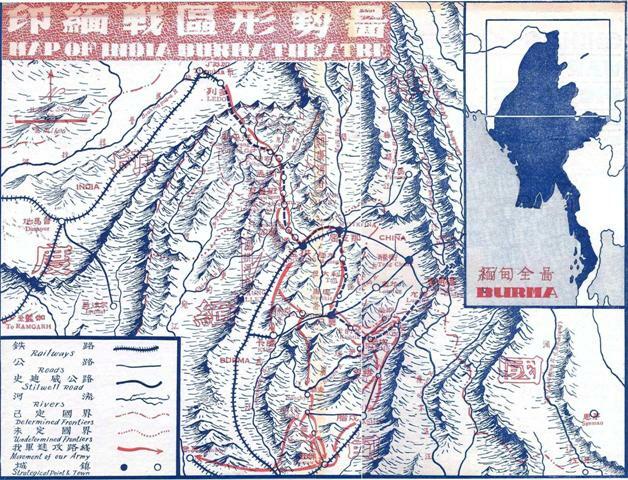 The building of the India-China Road had by this time made considerable headway, that the New 22nd Division was now able to launch forward from Ledo into the Hukawng Valley. 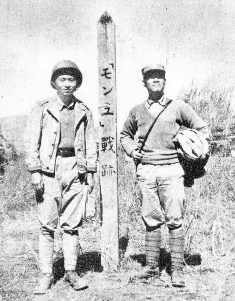 After taking Taro in January the Division marched southwards toward Maingkwan, assisted by the 1st Tank Battalion in a joint operation. 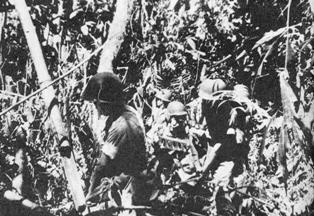 An American Regiment transferred from the South Pacific also joined in the campaign. 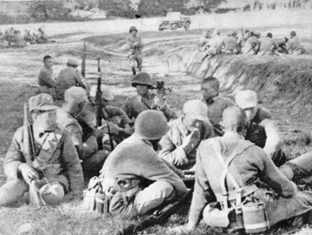 In the battle of Maungyang River, the 114th Regiment captured secret orders issued by the enemy and the New 38th Division was thus enabled to proceed to behind the southern lines of the enemy and cut off his retreat. On March 4, the enemy was surprised at Maingkwan, which fell the following day. The New 38th Division pushed on towards Walawbum, the last enemy stronghold in the Hukawng Valley. 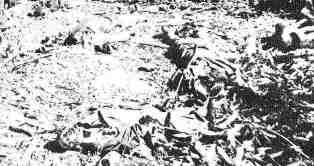 The enemy put up a stiff resistance at this point for four days, and casualties were heavy, no less than 757 corpses were left by him after the fall of the place. 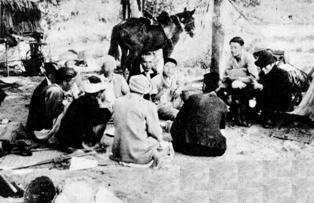 With the capture of Walawbum on March 9, the campaign in the Hukawng Valley was brought to a successful end. 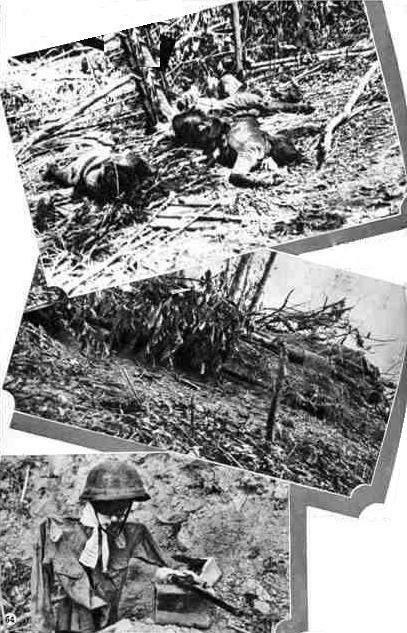 TOP: CASUALTIES LEFT BY THE FLEEING ENEMY. 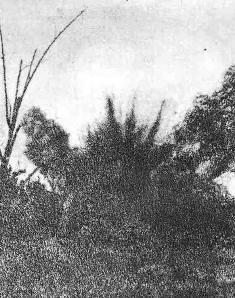 MIDDLE: EVACUATED POSITION DESTROYED BY SEVERE BOMBARDMENT. 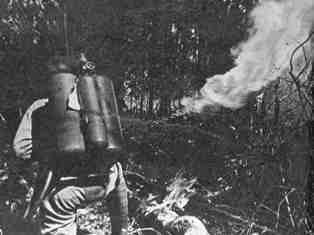 BOTTOM: DUMMIES USED BY THE ENEMY AS SHOCK ABSORBERS. Between the Hukawng Valley and the Mogaung Valley lies a 4,000-foot hill. A small path provides the only link between the two valleys. 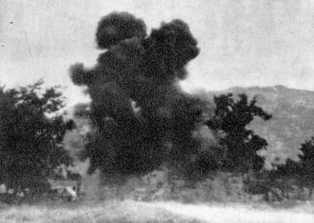 The New 22nd Division, with the Tank Corps, launched a frontal attack against the Mogaung Valley, while the New 38th Division, braving all difficulties of cliff climbing, went over to the back of the enemy. 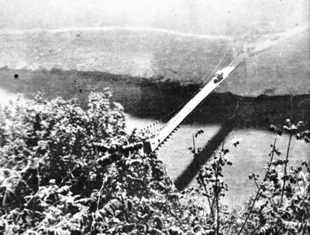 Fourteen days' arduous hill climbing brought the New 38th Division to a point 20 miles to the rear of the enemy, and Laban was taken immediately to cut off the enemy retreat. 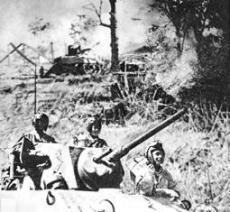 Meanwhile, the New 22nd Division also advanced against the enemy from the north and the two forces effected a junction at Shadazup. 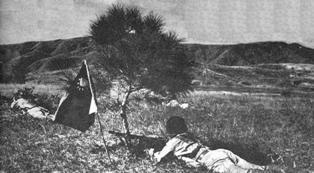 The enemy took full advantage of the mountainous terrain of the Mogaung Valley in laying defense positions. The rainy season in Burma was approaching by the end of May, and advance was checked. 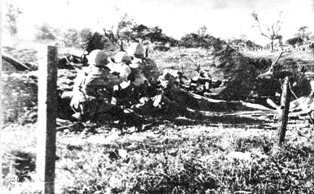 The New 22nd Division was held by the enemy at Malakawng. 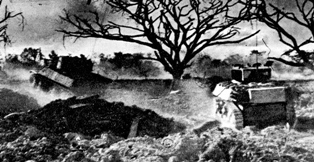 General Sun Li-jen considered it necessary to employ special strategy if the Mogaung war was to be concluded before the full blast of the rainy weather. A bolder attempt to send a regiment to the rear of the enemy was made. 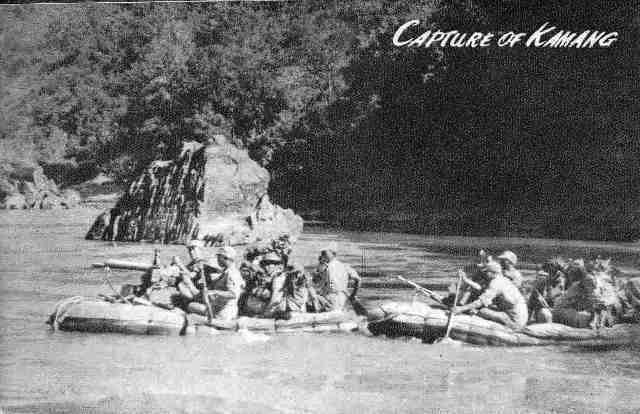 The 112th Regiment chosen for the purpose ran the enemy blockade across the Namkawng River, and took by surprise Seton, five miles to the rear of enemy-held Kamaing on May 26. Confusion was poured into enemy ranks. 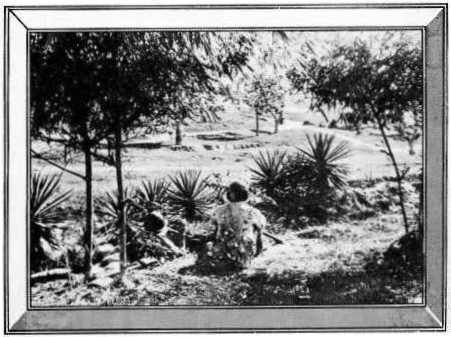 The enemy rushed reinforcements for the relief of the position, and during the fierce fighting that ensued, heavy casualties were inflicted on his troops, while the Chinese also suffered more than 300 losses. 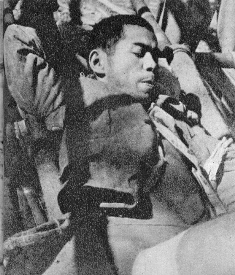 The loss of Seton sealed the fate of the enemy in Kamaing. 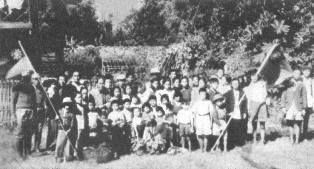 From May 29, Zigyun on the bank opposite Kamaing was subjected to bombardment and it fell on June 9. 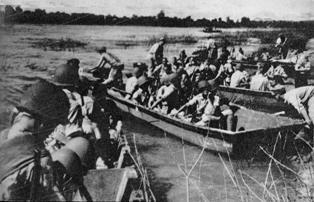 On the morning of June 16, a forced crossing was made, the wait being occasioned by the need to obtain supplies of rubber boats. The enemy had lost his morale, and the capture was imminent. 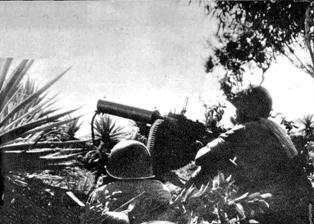 While the 113th Regiment was still attacking Zigyun, the 114th Regiment had proceeded rapidly towards Mogaung City. By June 15, many points to the north of the city had been placed under control. 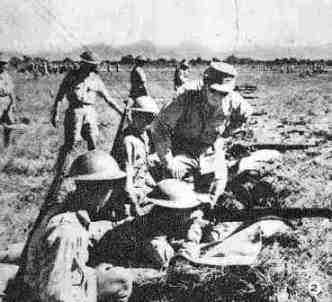 At the same time, the 77th British Brigade which paratrooped into Katha two months previously was being encircled by the enemy and the Chinese came to their rescue in time. The city itself was captured after two days of hard fighting. 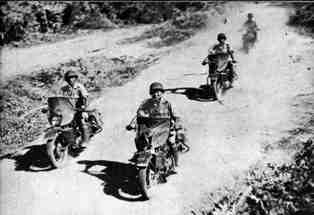 Enemy troops along the road from Kamaing to Mogaung still offered resistance despite the fall of both cities. They were duly taken care of. 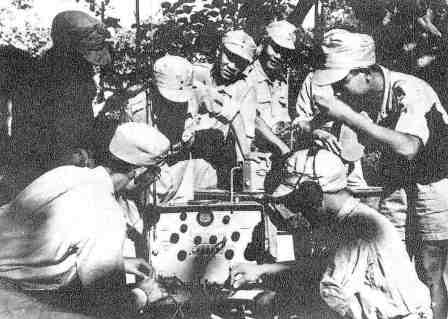 The battle of the Mogaung Valley had been successfully concluded. 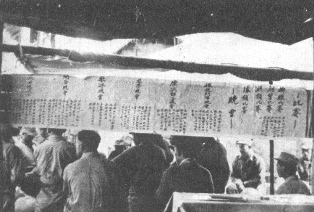 General Stilwell, in a telegram congratulating General Sun Li-jen, referred to the victory as a top-notch achievement. 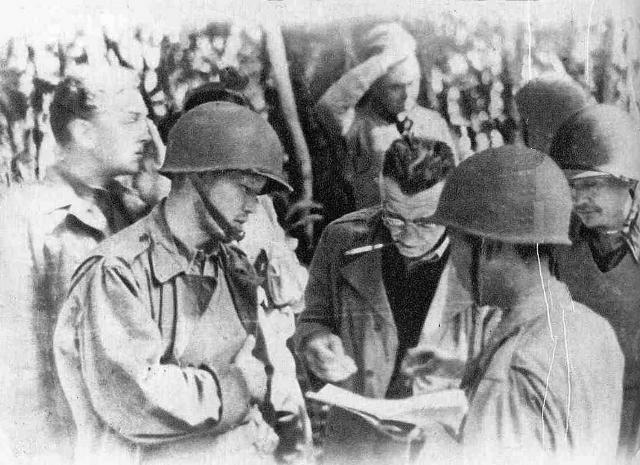 The Divisional Commander of the 3rd British Indian Division congratulated General Sun and General Li-hung for the great victory, and expressed gratitude for the assistance rendered the 77th British Brigade. 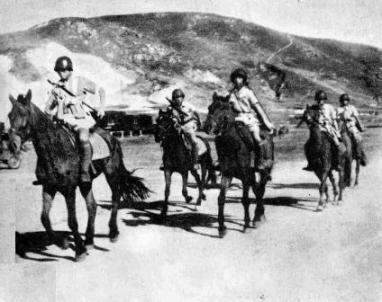 AT THE CAPTURE OF TAIPHA GA BY THE NEW FIRST ARMY, A U.S. INFANTRY REGIMENT ARRIVED AT THE HUKAWNG VALLEY, IN JOINT OPERATION WITH THEIR CHINESE ALLIES. 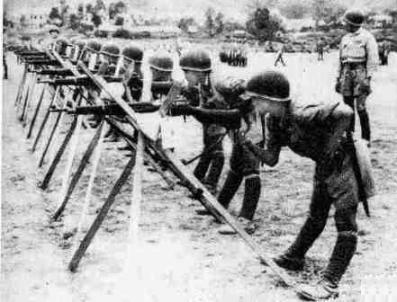 Before the commencement of the battle in the Mogaung Valley, the New 30th Division of the New First Army had already been trained intoi a combattant unit. 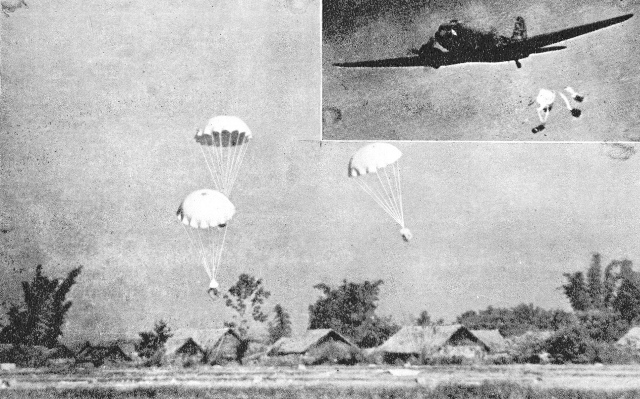 It was further reinforced by the 14th and 50th Divisions, airborne into Burma. 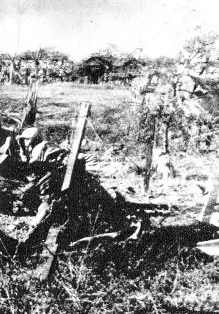 With the exception of the 149th Regiment of the 50th Division, the various units making up the three Divisions referred to in the first paragraph did not participate in the battle in the Mogaung Valley. They created a new battlefield for themselves. 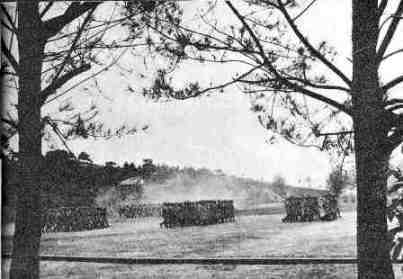 In the latter part of April, while the fighting in the Mogaung Valley was in progress, another force consisting of the 88th Regiment of the New 30th Division, the 150th Regiment of the 50th Division, and a regiment of United States infantrymen was concentrated at Maingkwan, and pushed southeastward for a surprise attack on Myitkyina. On May 19, the railway station was occupied for a time. 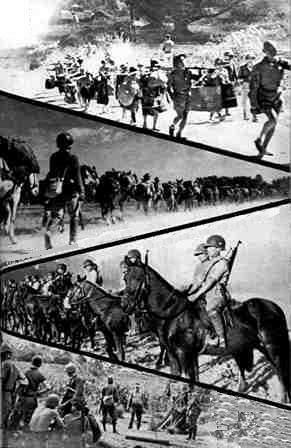 Further reinforcements arrived on May 21 from Ledo, this being the 42nd Regiment of the 14th Division. 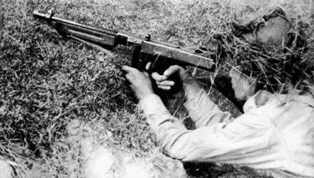 The enemy, meanwhile, took advantage of the respite in sending for help and in consolidating his defense positions. The combating forces were interlocked against each other from May to mid July, when the battle reached the decisive stage. 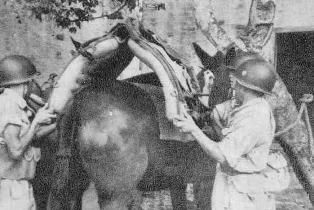 On August 3, the 50th Division organized a Dare-to-Die Corps which broke down the last of the enemy's stubborn resistance. MUD, AS A RESULT OF HEAVY RAINFALL, MADE THE PASSAGE EXTREMELY DIFFICULT. 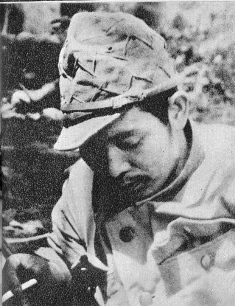 COLONEL CHEN MING-JEN, COMMANDER OF THE 112TH REGIMENT, IN CHARGE OF THE ASSAULT. 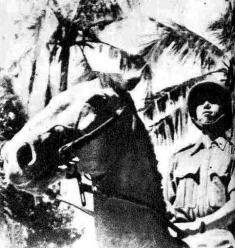 CAPTURE OF KAMAING. THE FLEEING ENEMY LEFT NUMBERLESS CORPSES BEHIND. 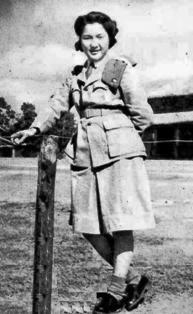 MISS FANG YEN, TYPICAL OF THE CHINESE NURSES ACTIVE ON THE NORTH BURMA FRONT. 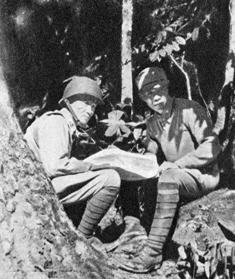 In the Burma Campaign, the Chinese and Americans undertook two different tasks. 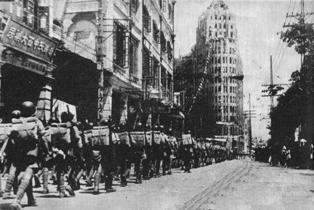 The first were engaged in fighting, the latter in transportation and supplies and their cooperation made success possible. 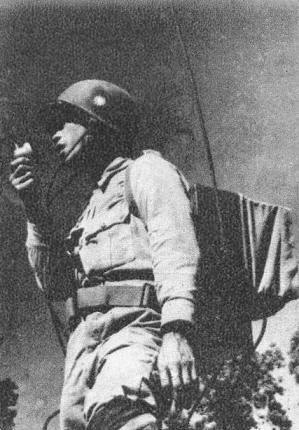 In addition to transportation and supply, the work of giving first aid was also undertaken by the service forces. 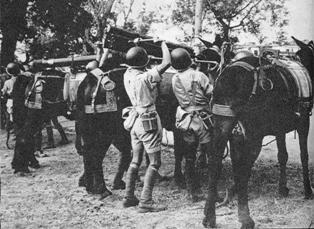 Ambulance and first aid work during the Burma Campaign was most satisfactory. From field surgeons tp field hospitals, station hospitals to base hospitals everywhere the work of giving medical attention to the needy was carried out efficiently and satisfactorily thus reducing the suffering of the wounded to a minimum. 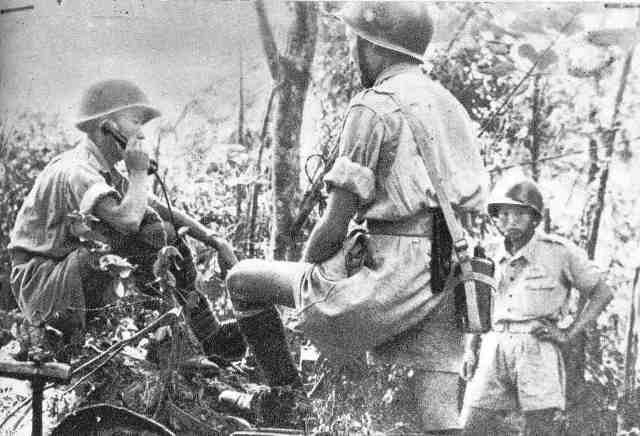 The medical services were so satisfactory that during the Burma Campaign many soldiers returned to the front after being wounded many times over. No less than 18 men had been wounded six times. Excepting those who fell in actual fighting, a very high percentage of the wounded recovered and were fit for service after treatment. LEFT GROUPING TOP: THE PEACEFUL IRRAWADDY. BOTTOM: GUARDIANS OF PEACE. 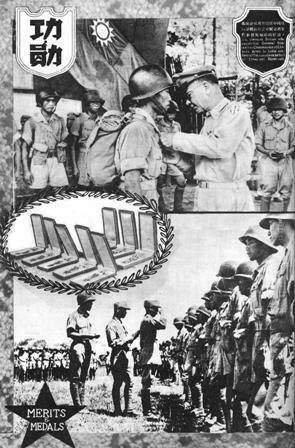 RIGHT GROUPING TOP: LT. GEN. SULTAN WHO SUCCEEDED GEN. STILWELL AS COMMANDER OF CHINESE ARMY IN INDIA CONFERRED THE MEDALS ON BEHALF OF PRESIDENT ROOSEVELT. 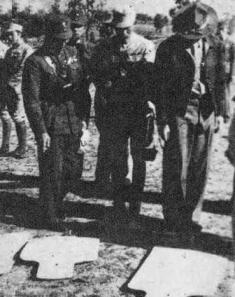 BOTTOM: OFFICERS AND SOLDIERS OF THE NEW 38TH DIVISION WERE DECORATED BY THEIR DIVISIONAL COMMANDER, MAJ. GEN. LI HUNG. 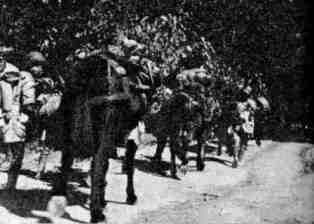 The New First Army rested at Myitkyina for nearly two months. By October, the rainy season in Northern Burma was over, the C.A.I. 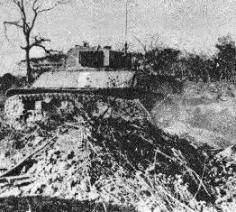 launched its second major offensive. 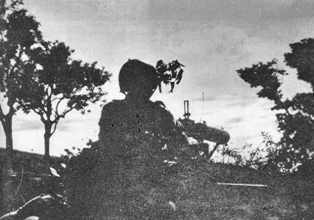 The New First Army was to launch a frontal attack on Bhamo, while the New 6th Army was to head towards Shwegu from the left. 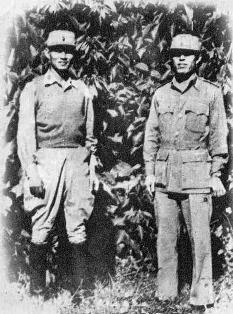 The last named post was captured on October 29, after which the New 6th Army was recalled to China Theater and the Burma Campaign thenceforth was solely undertaken by the New First Army. 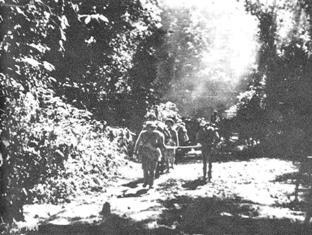 From Myitkyina to Bhamo was mountainous terrain, which was helpful to the defense and provided difficulties for the attackers. 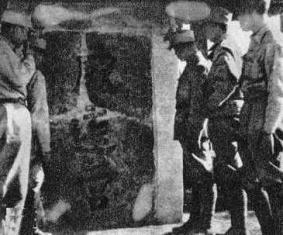 During its march towards Bhamo, the New First Army unearthed en route a stone memorial of great historical importance. It was a commemorating tablet of one of the Chinese expeditions to the district in the Ming Dynasty, and characters "Wei Yuan Ying" (Overwhelming Afar Barracks) were boldly engraved on the center of the tablet. 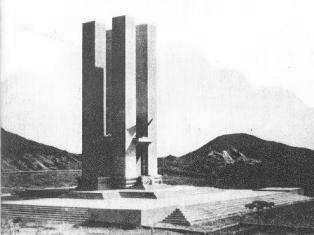 A description of the events leading to the erection of the memorial testified to the military operations and established the strategic importance of Bhamo even in those old days. 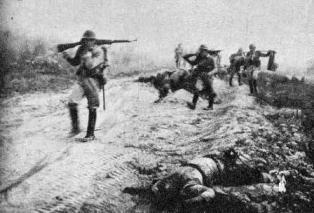 Early in November, the New 38th Division had registered great progress in the advance. 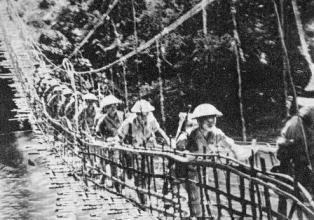 At this juncture, the Army made use of the great suspension bridge which had been built by one of the famous Chinese generals who undertook one of the expeditions into Burma during the Tsing dynasty. 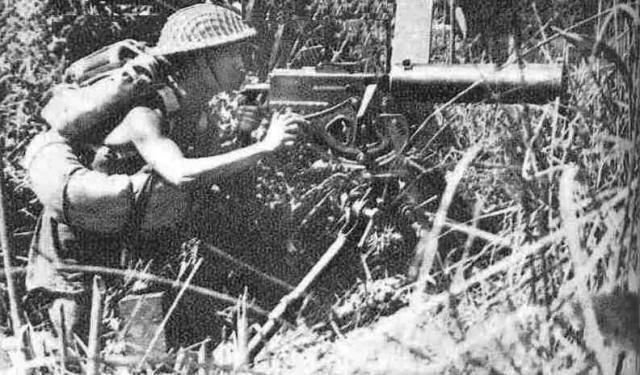 The enemy made full use of the boggy nature of the terrain at Bhamo in laying his defense positions which, it was later made known, took eight months to build. 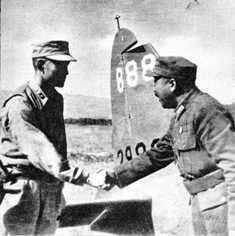 By November 16, the Chinese Army had taken the suburban regions and three of the airfields. The enemy retreated to the inner defenses within the city, and offered stiff resistance. He was immediately encircled. 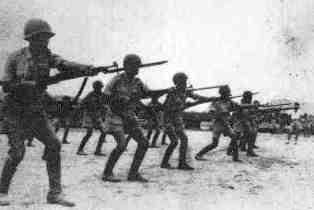 Street fighting ensued and the Chinese encirclement of the enemy was gradually tightened. The city of Bhamo was completely captured on December 15. The enemy was completely wiped out, and a large booty was captured. To commemorate this signal victory, the Allied Supreme Command in Northern Command named the road from Memauk to Bhamo the Sun Li-jen Highway, while a street in Bhamo was renamed Li Hung Road. 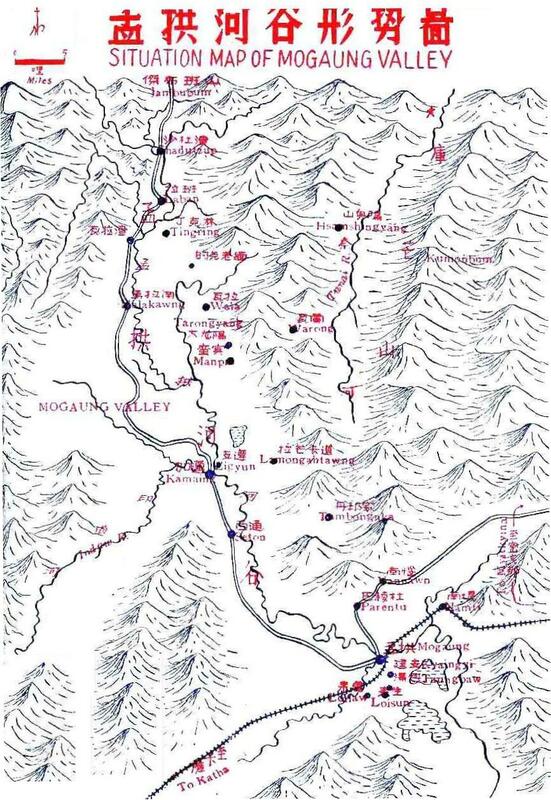 While the battle for Bhamo was still in progress, General Sun Li-jen ordered the New 30th Division to proceed forward beyond Bhamo, heading for Namhkam. 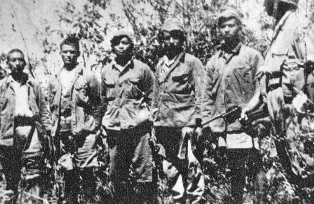 The enemy was given a surprise by the New 30th Division's march on Namhkam while the New 38th Division was still fighting for Bhamo. 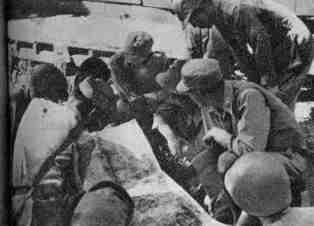 Reinforcements were brought in hurriedly in an attempt to disperse the New 30th Division and thence to go to the relief of Bhamo. 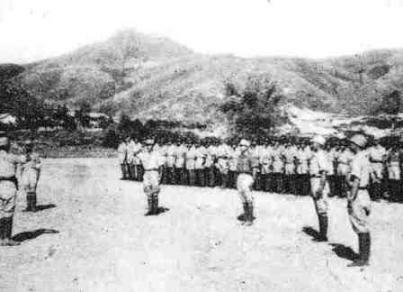 These forces, recently transferred from Korea, met the New 30th Division at the Kaibtik plateau, and the first frontal battle of Northern Burma took place. Kaibtik is the highest salient between Bhamo and Namhkam and is of such strategic importance that its capture would be decisive in the battle for Namhkam. After a number of battles, the enemy was completely routed, abandoning 1260 dead when they retreated by December 14. The approach to Namhkam is a narrow valley enclosed by mountains, and is neither easily attacked nor defended. 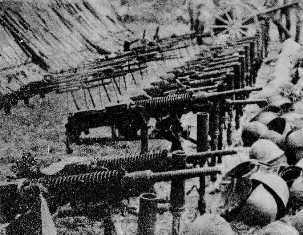 By this time, Bhamo had already fallen, and the forces attacking Namhkam were reinforced by two regiments from the New 38th Division. 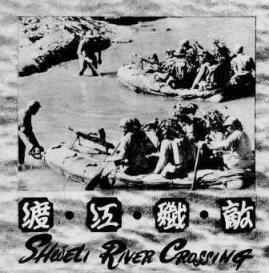 The most eventful episode at this period of the campaign was the crossing of the Shweli River, a watercourse flanked by high cliffs offering a great risk to the undertaking. 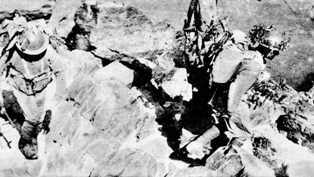 Little fighting was expected in the Namhkam Valley itself, but the problem was the securing of the mountains surrounding the valley. 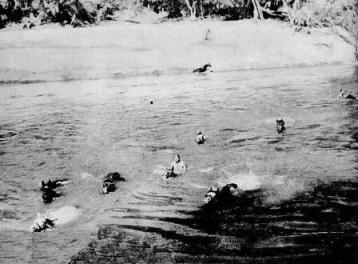 After successfully crossing the Shweli River, the Chinese forces had little difficulty in breaking through enemy lines in the vicinity of Namhkam. 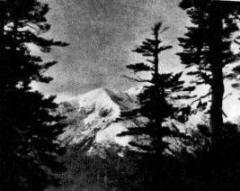 On the morning of December 15, the Namhkam Valley was enveloped in a thick fog. 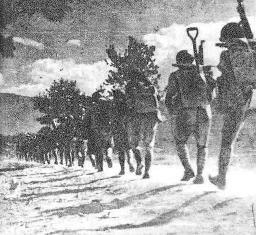 The 90th Regiment marched through the fields into the town of Namhkam, which was fully captured before noon that day. 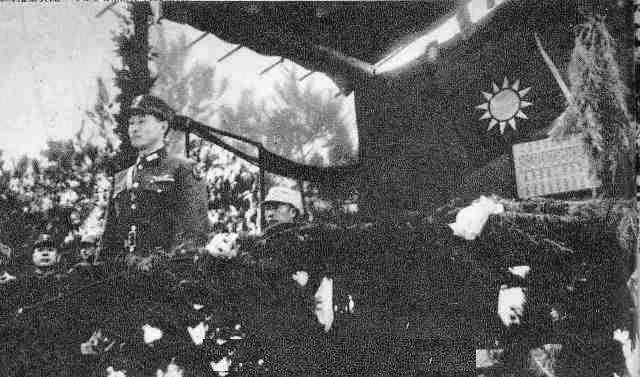 GENERAL SUN AT THE NAMHKAM FRONT, ACCOMPANIED BY MAJ. GEN. SHIH-YUEH, HIS CHIEF OF STAFF. CONGRATULATIONS! LONG LIVE CHINA! LONG LIVE THE ALLIES! 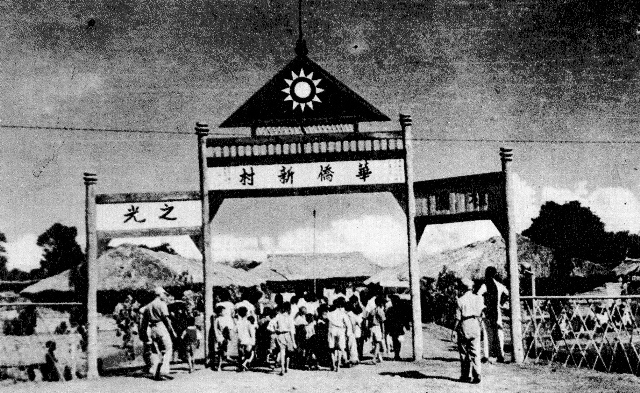 After the capture of Namhkam, the New 38th Division did not allow the enemy breathing space, and continued to march rapidly on to Mongyu, the intersection point between the new India-China Road and the old Burma Road. 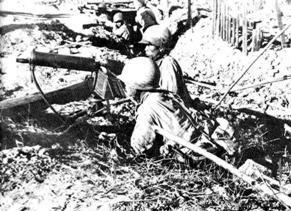 The point was captured on January 27, 1945, and the historic junction of the Chinese Army in India and the Chinese Expeditionary Force from west Yunnan was effected. 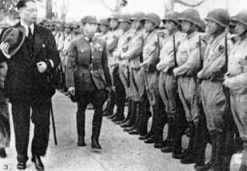 The khaki-clad New First Army and the grey cotton-padded uniformed Expeditionary Force arrived at the appointed meeting place early in the morning when the ceremony was witnessed by a number of ranking Chinese and American generals. 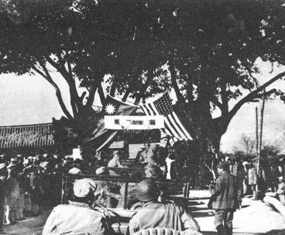 The Chinese National Flag and the Stars and Stripes were hoisted amidst the playing of the national anthems of the two countries and a salvo of gun fire. In an address on the occasion, General Wei Li-huang referred to the junction as the most important achievement in Sino-American cooperation. 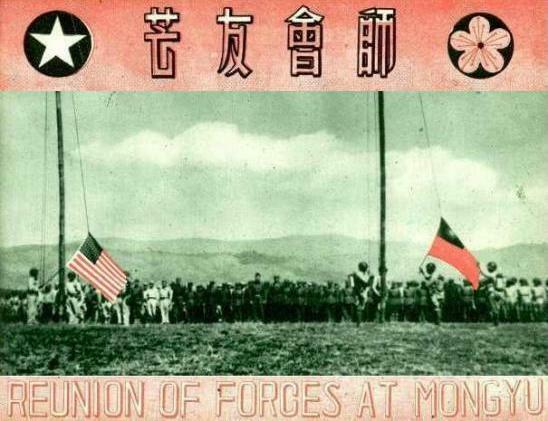 The principal slogan of the day was "To Tokyo," and the junction at Mongyu was celebrated as the prelude of the meeting of the Allies in Tokyo. After the ceremony, the two forces parted company. The Expeditionary Force returned to China. 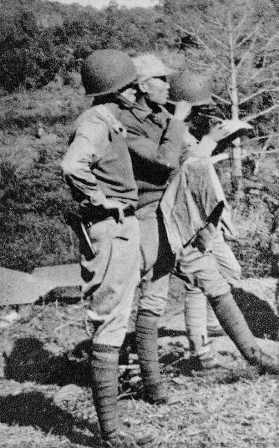 But the Chinese Army in India had not yet completed its duties - the safeguarding of the Stilwell Road. 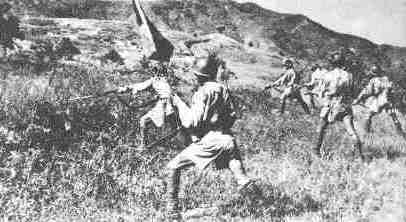 The stalwart sons of the New First Army continued their march on Lashio. 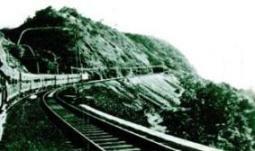 With the junction of the Chinese armies at Mongyu, the India-China Road was cleared of the enemy. 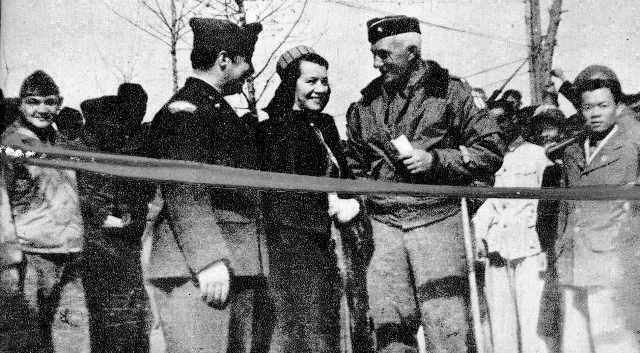 The road was officially opened and named after General Stilwell by Generalissimo Chiang Kai-shek. One hundred and five vehicles participated in the ceremony for the opening of the highway - the first convoy traveling from India to China. 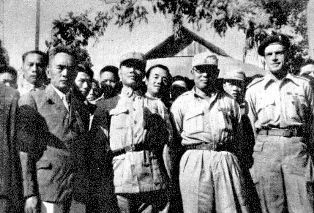 When the convoy passed through the Field Headquarters of the New First Army, General Sun Li-jen gave an official reception at which the guests were offered Chinese and Australian food, American cigarettes, British matches, and Indian liquor. The official opening ceremony was held at Wanting, and presided over by President of the Executive Yuan Dr. T. V. Soong. 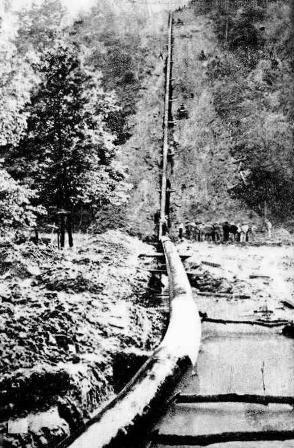 The opening of the Stilwell Road was soon followed by the opening of the India-China pipeline. 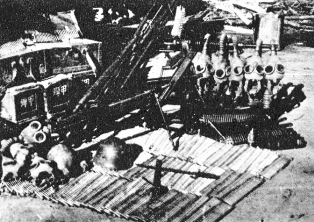 Trucks using the highway sent supplies of arms for the improvement of the equipment of the Chinese fighting forces, while the pipeline brought into China the fuel needed for the motive power of the China war theatre. A great stride was made towards victory. BRIG. GEN. 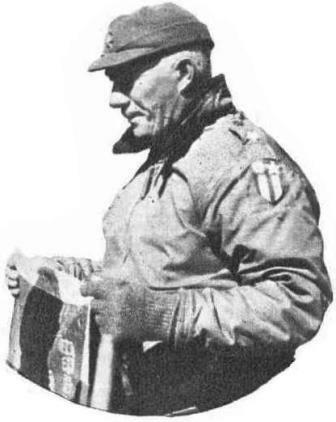 PICK, COMMANDING GENERAL OF ENGINEER CORPS, U.S.A. WHO WAS RESPONSIBLE FOR THE CONSTRUCTION AND ITS COMPLETION AND FOR WHOM THE ROAD WAS SUBSEQUENTLY DUBBED "PICK'S PIKE." 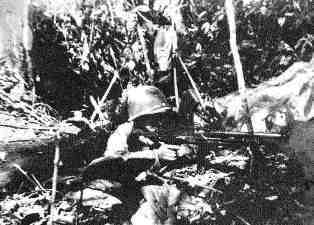 While the enemy was cleared off from the Stilwell Road, he still maintained forces at Meng Yu and Namhakka. The New 50th and New 38th Divisions therefore continued to clear these districts of remnant enemy units, and the divisional commander of the enemy 56th Division barely escaped being taken prisoner in the engagement. 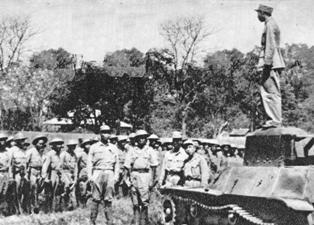 Hsenwi was captured by the New 30th Division on February 20, when the march on Lashio was launched. 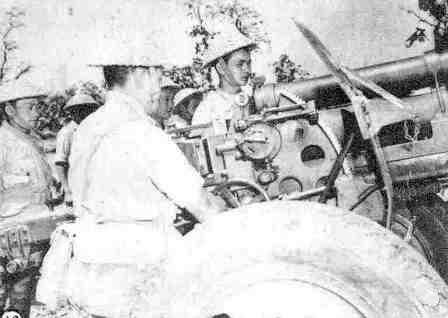 The 30 odd miles separating Hsenwi and Lashio was very mountainous territory, and the progress was necessarily slow but now with the arrival of armored car units our forces were reinforced. The old town of Lashio fell on March 6, while the new section of the town fell three days later. 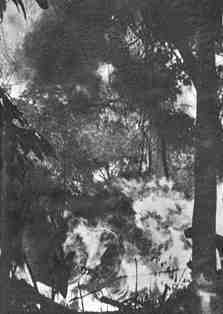 The capture of Lashio completed the mission of the New 38th and the New 50th Divisions, but the 50th Division had still to effect the last act in the Burma campaign. 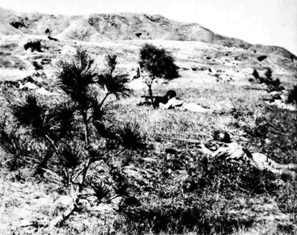 The 50th Division, after the Mogaung Valley campaign, was first charged with the task of affording assistance to our British Allies (36th British Division) in their attack of Katha which was successfully accomplished. 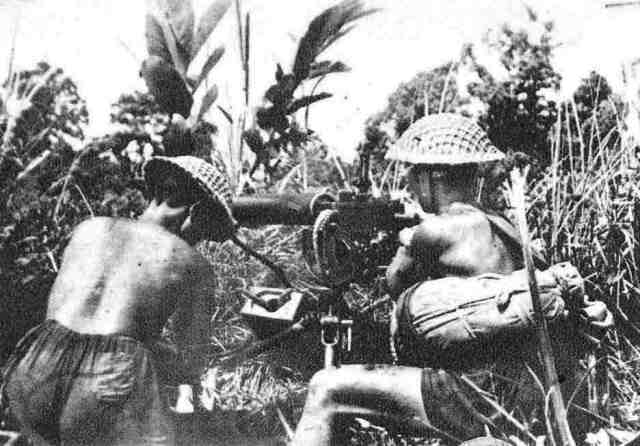 The 50th Division then crossed the Irrawaddy to mop-up the remnant enemy units in that district. 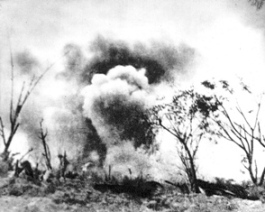 The battle for Mwanhawn was the fiercest engagement in this connection, and the point was captured after a series of vogorous attacks. 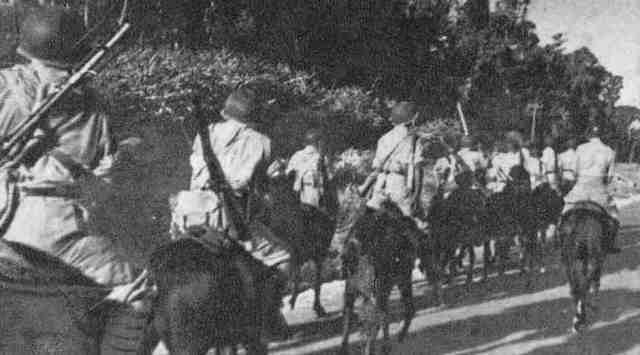 The 50th Division carried on its victorious march southwards and by the middle of March captured Hsipaw and on March 23 effected a junction with the New 38th Division on the Naphai Highway. 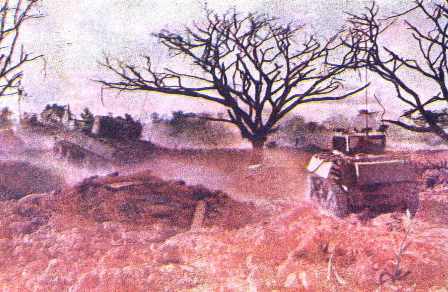 The area west of Hsipaw was virtually a British war zone but because of the swift advance of Chinese Army the British were enabled to push immediately southwards to lower Burma, leaving the Chinese forces to capture the important point of Kyaukme west of Hsipaw with which Chinese Army in India concluded its brilliant Burma campaign. 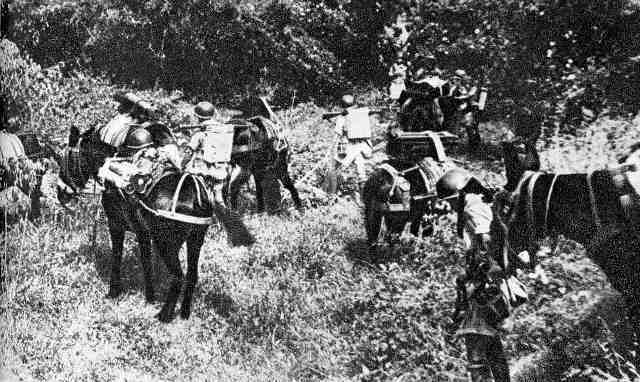 No less than six Japanese Divisions were routed by the New First Army in Burma, the casualties amounting to 100,000, with 323 taken prisoner. 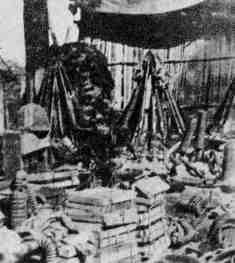 Trophies captured by the New First Army included 7,938 rifles, 643 machine guns, 186 cannons, 553 motor vehicles, 453 locomotives and wagons, 67 tanks, 5 planes, 108 warehouses and more than 20,000 tons of metals. 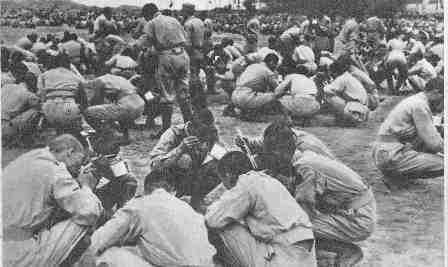 It must be admitted that the Japanese soldier was fully imbibed with the spirit of sacrifice, which was especially demonstrated in the Saipan and Iwo Jima engagements in the Pacific where the Japanese willingly died rather than surrender. 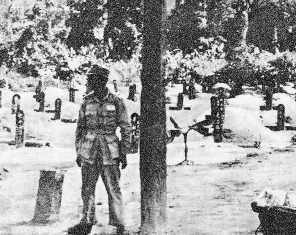 Accordingly, in the wide stretched battlefield of Burma where more than 2,000 engagements took place, only 300 odd prisoners were taken, amounting to 0.3 percent of the number of their casualties. 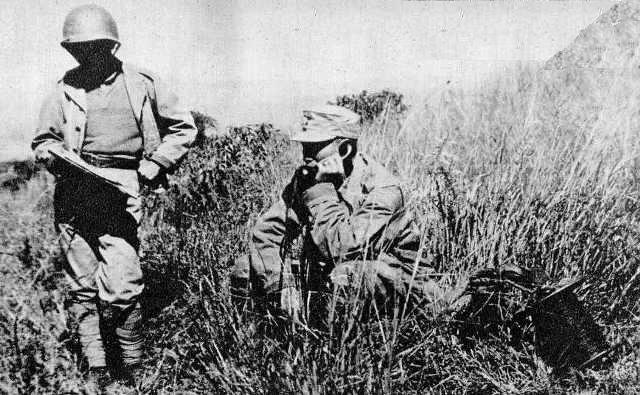 However, a low ebb in Japanese morale was noticeable with his defeat at Yupong Ga, where the Japanese militarist hold on the rank and file began to lose his grip. 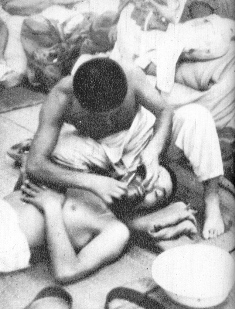 The best treatment possible was accorded the Japanese war prisoners who were subjected only to restrictions in their movements but received all the medical attention they needed. 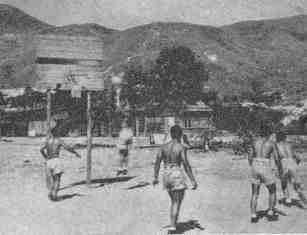 The stubbornness of these prisoners were soon won over and they were made to realize their folly in playing into the hands of their ambitious military aggressors. 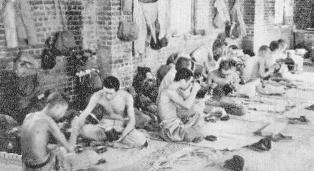 The prisoners taken in Burma were ultimately transferred to internment camps kept by the Allied Command at New Delhi. 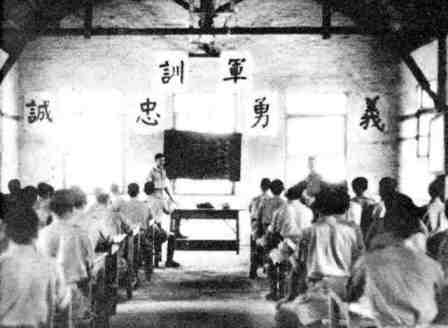 In addition to military training, spiritual training was given the Chinese Army. During the training at Ramgarh, a campaign against illiteracy among the enlisted men was carried out. When the men were sent into actual battle, their cultural life was not neglected. 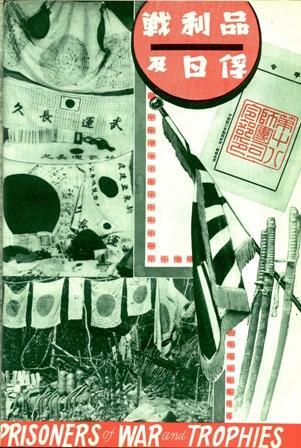 Newspapers were issued among various units. 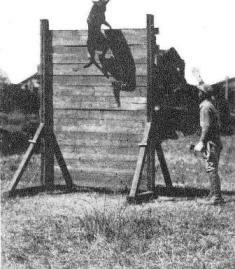 Dramatic entertainment was also successfully carried on to benefit the men. 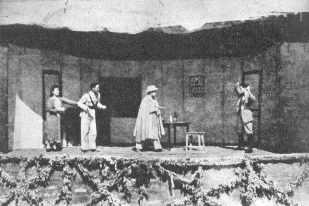 Performances were often staged by their own members even during the progress of fighting. 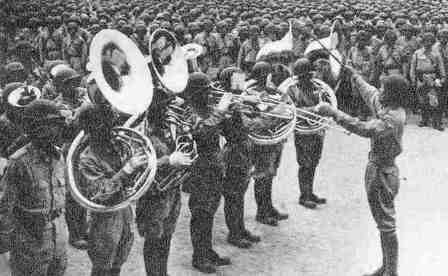 Motion picture squads were later also introduced as an additional recreation. 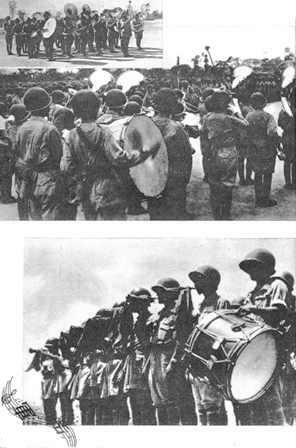 THE CHORUS ORGANIZED BY THE PD OF THE NEW 38TH DIVISION, ITS MEMBERS CONSISTING OF CHINESE RESIDENTS IN BHAMO WITH AGES RANGING FROM 6 TO 40. 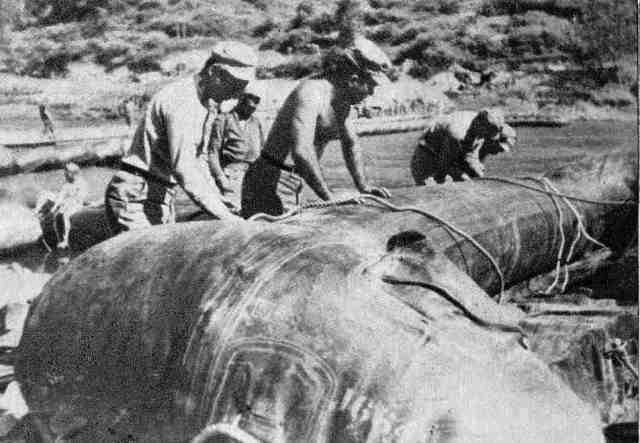 The Army also undertook work in establishing good relations with the population in the war zones - a measure which proved most effective in promoting cooperation between the Army and the people. 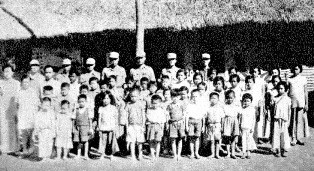 Special Service workers of the Army visited villages to bring succour to the population suffering from the Japanese invaders. Their sympathy was soon won and they cooperated in various measures to the progress of the military operations. 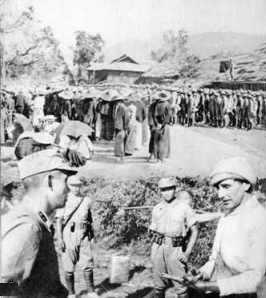 The Army also took time to pay attention to the improvement of the large numbers of overseas Chinese communities in Burma. In this interaction, General Sun Li-jen was personally interested in various schemes for the betterment of the lot of the Chinese residents. 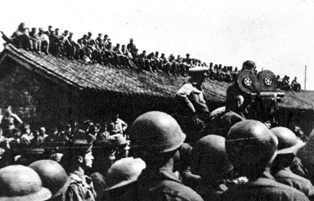 After the victorious conclusion of the Burma campaign, the New First Army was assembled at Myitkyina to await orders for its triumphant return. 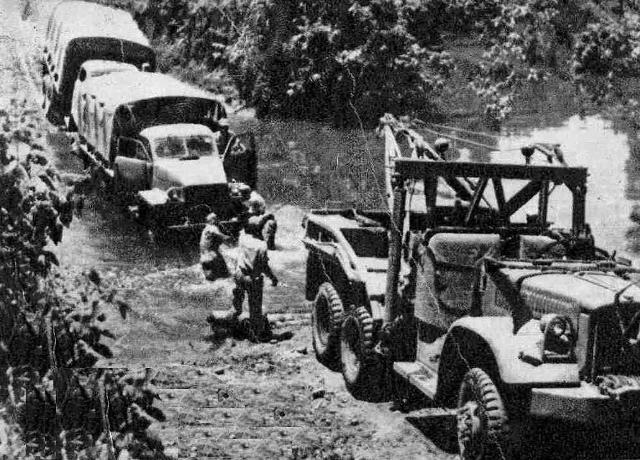 Towards the end of June, 1945, our Allied Air Force placed more than 30 air transports of the C-46 and C-47 models for the transportation of the New First Army back to China. 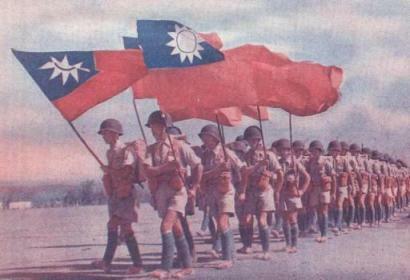 The general counter-offensive in the China Theatre was to be launched, and the New First Army was to take up the task of the offensive against the enemy on the Liuchow Peninsula, to coordinate with the operations of our Allies in the Pacific. 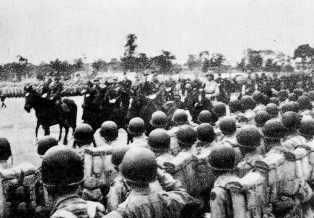 While the New First Army was marching towards its new destination from Nanning in August, 1945, the Japanese announced their unconditional surrender. 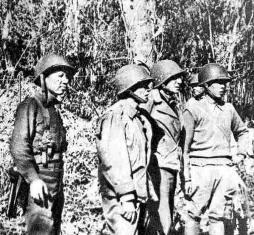 The Army was then commissioned with the new task of accepting the enemy's surrender in the Canton area. 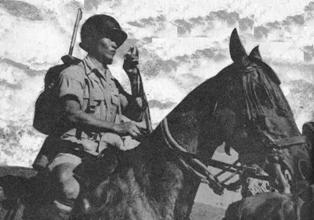 The brilliant victories scored in Burma by the Chinese Army in India were neither accidental nor sheer luck. The general conception that the success was chiefly due to the efforts of our Allies was also exaggerated. 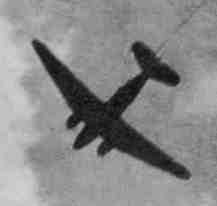 Of course, air support, efficient supply lines, and excellent first aid service by our Allies contributed much to the outcome, but the main source of success lay in the hardy fight put up by our own men. 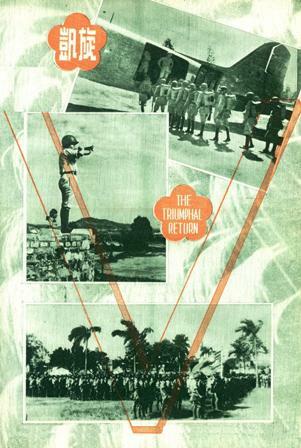 High morale and capacity for endurance marked the principal characteristics of the C.A.I. 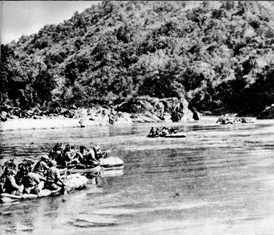 The operations carried out over difficult terrain in northern Burma were further complicated by the roundabout movements which were employed on more than one occasion to surprise the enemy. 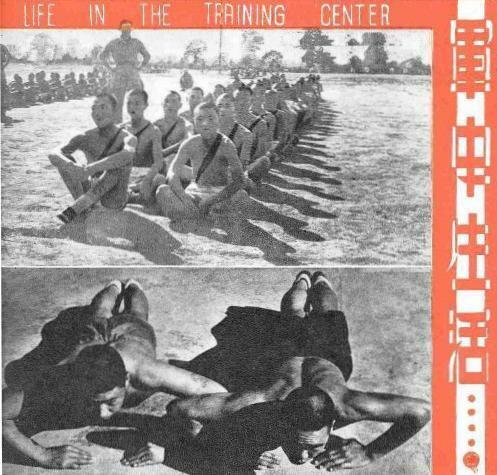 The stamina and ability for physical endurance displayed by the Chinese troops made a great impression on the United States Medical Corps, and even on the enemy who prided his bushido. 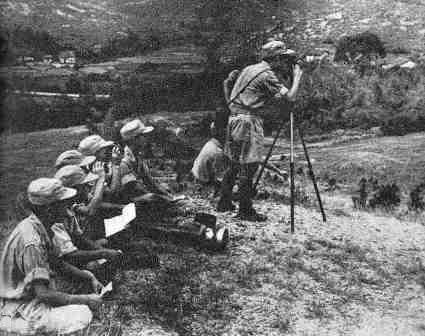 Superior strategy and efficient command also marked the Burma campaign where the Chinese Army usually took the initiative in the engagements. 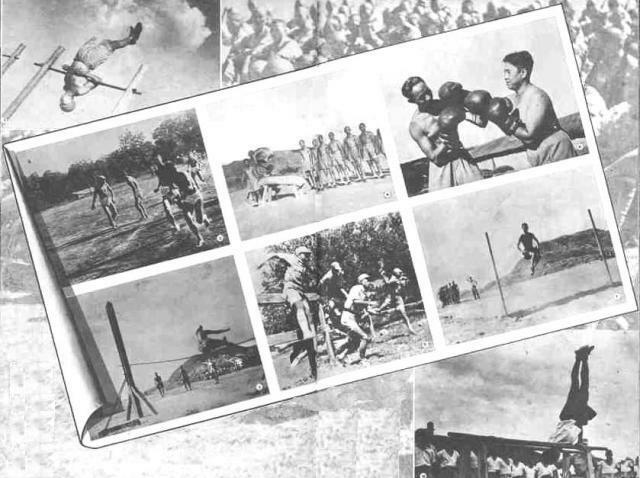 The intensive training received by the C.A.I., which was continued even during the campaign when no actual fighting took place, was another factor which ensured victory. 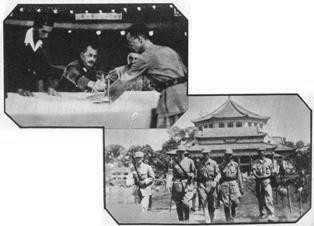 TOP: THE LOCAL COMMANDER OF THE JAPANESE FORCES SIGNED THE INSTRUMENT OF SURRENDER. BOTTOM: GENERAL SUN COMING OUT OF SUN YAT-SEN MEMORIAL WHERE THE SURRENDER WAS JUST SIGNED. 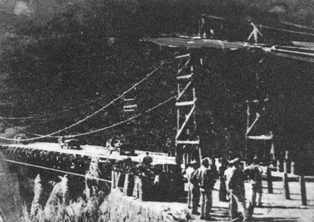 THE NEW FIRST ARMY SELECTED A 119-ACRE AREA ON THE WHITE CLOUD HILL NEAR CANTON TO ERECT ITS TOMB FOR THE FALLEN. ABOVE: THE MEMORIAL TABLET STANDING ERECT AT THE CENTER OF TOMB. RIGHT: INSCIRTION ON THE MEMORIAL TABLET. 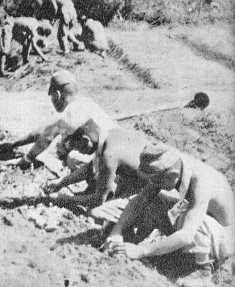 BELOW: JAPANESE PRISONERS AT WORK ON THE TOMB. 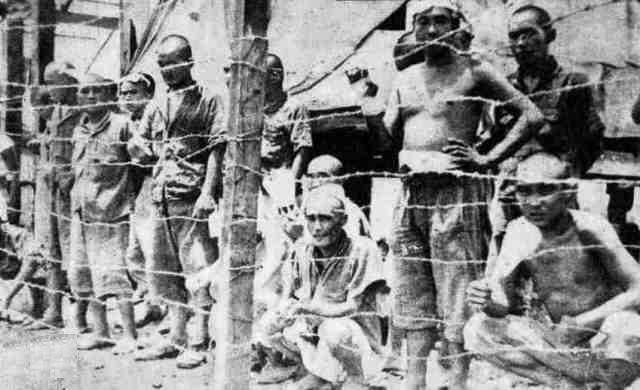 BOTTOM: OTHER JAPANESE PRISONERS BEING SENT TO CONCENTRATION CAMPS.